I hope you all had a Happy Australia Day. On the 26 we celebrated all the things we love about Australia: our land, sense of fair go, lifestyle, democracy, the freedom we enjoy and in particular the freedom to pursue our artistic dreams. With that in mind Armadale Society of Artists goal this year with our Committee and Volunteers is to develop and establish the Art House on Hobbs to it’s full potential for it’s Members and the Community to enjoy. Our AGM is the first event for this year on Thursday 7 February when we get to elect our new 2019 Committee and farewell our members of Committee stepping down. 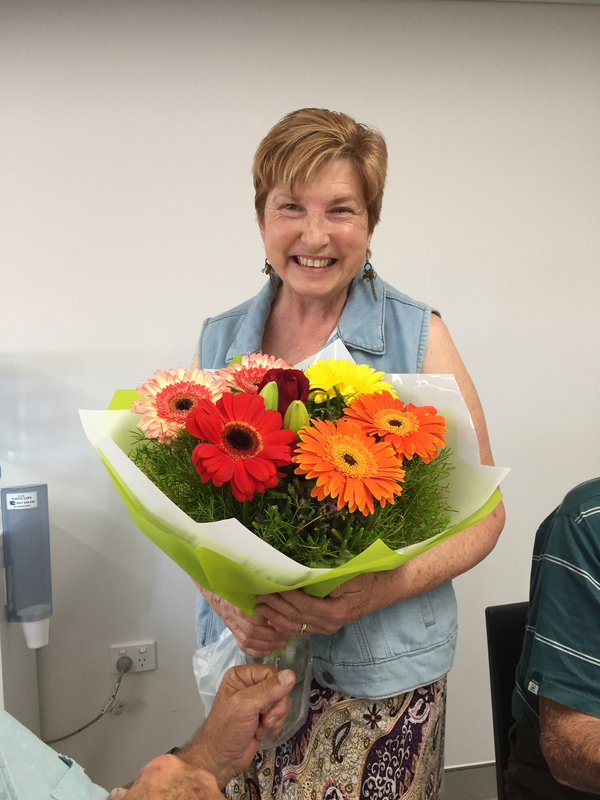 We will also be saying farewell and a thank you to two of our support volunteers Lucia Dulin who organised our 2018 Demonstrators and we will be welcoming Deb Weber to that role. Also to Isabel Colenutt our Face Book Co-ordinator who is moving away from the area. and welcoming member Debbie Woods. Dot is continuing in her valuable support role this year as Newsletter Editor and Coordinator of our website. We can’t stress enough how important it is to come along and support this AGM so we get our required quorum. If you can’t attend please complete the proxy form and hand it to a member attending or post your ballot form to our Secretary. The AGM coincides with our renewal of Annual Membership Fees and Vicky and Mary will be at Art House on Hobbs from 6pm to give our Members extra help to process our subscriptions and renewals. This year we are not waiting for inspiration to happen but we may have to go after it with a club to make things happen. 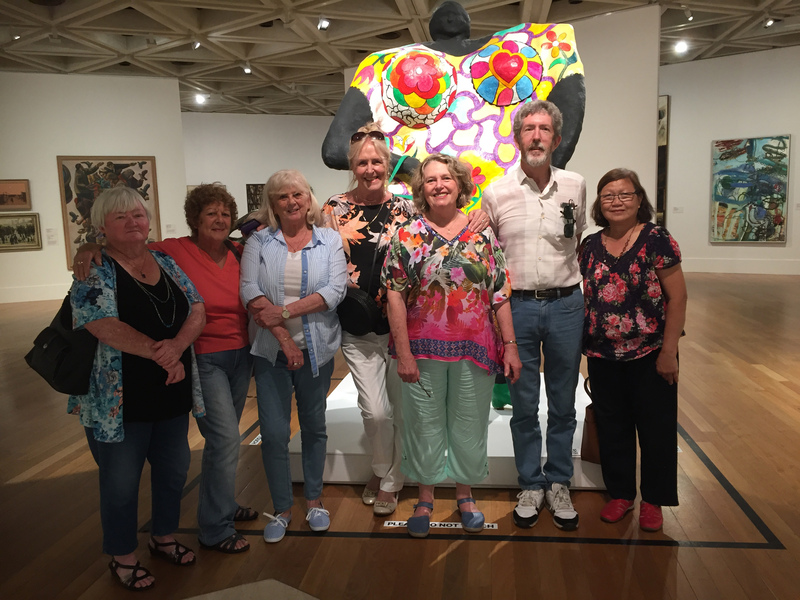 Members 2019 Membership Fees and Armadale Shopping City ASA Exhibition Entry and Fees closing date. 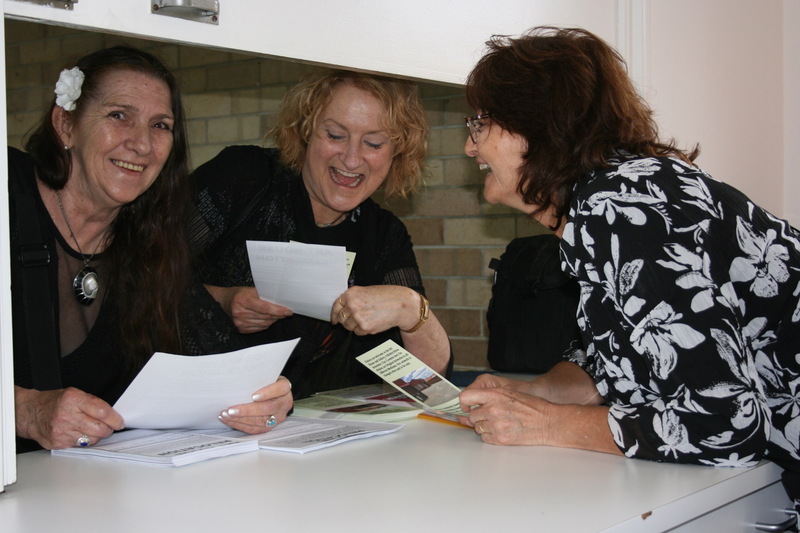 Vicky and Mary have arranged to come along earlier to assist in processing your 2019 Membership Subscriptions and paperwork and fees for Armadale Shopping City Exhibition. This months Members Meeting’s agenda is our Annual General Meeting. We look forward to seeing as many members attend as it is important to have our 33% quorum required to pass the motion for the incoming 2019 ASA Committee to be elected. 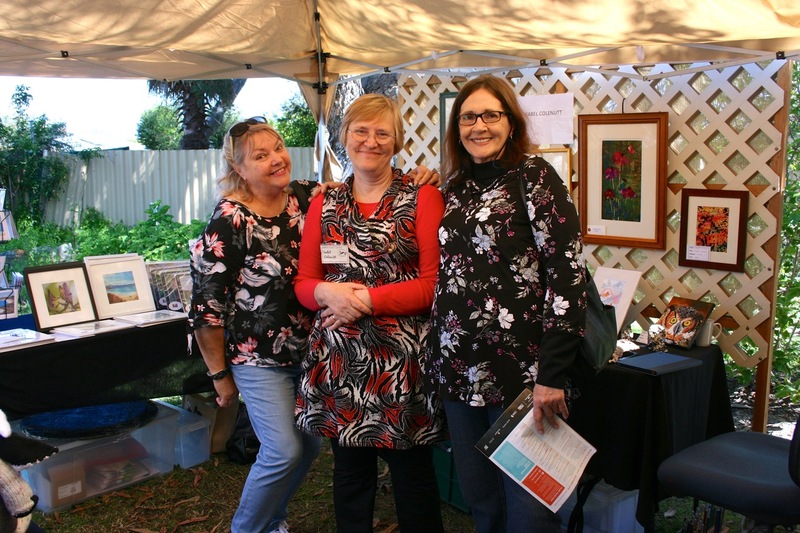 During Supper we will be welcoming Judith Eleuteri from Art and Craft World. This is her first attendance at a Members Meeting. Judith will be on hand with a selected display of art materials and has generously donated our raffle prize for the evening. if you can’t make our meeting please consider passing on your Proxy vote to a member attending or you can post your Postal Ballot before the meeting date. Judith Eleuteri from Art and Craft World. Well I’ve had a ticking off from the President to get going and start off the new year, it must have worked as I have recently finished 3 paintings. My story goes back only a few years to when I was 14 at school in England and I excelled at art, then at 15 I sat exams to enter an extended year at school for talented pupils. It happened to be at the school I already attended, and they only took 10 places for girls from all over the south of England, I won a place and so I did my 5th year at that school and achieved an A Level in art. So now I’m 17 and have won a scholarship to The Royal Academy of Art in London and my parents say we’re of to Australia and your coming too. So I get here sit more exams to enter the art college in Perth, get a spot, start training as a commercial artist, sign writing, advertising drawings etc, to find out that you couldn’t get a job as a ticket writer or window dresser unless you were a male, so I attended for 5/6 mths, hate it and Australia, meet a Londoner get married and go back to the UK. All before my 19th birthday. Fast forward a few years, travel, mortgages, working, businesses, children, I only ever managed a bit of doodling, so after being widowed in 2013 it was my time. It still took a long time and finally joined ASA a couple of years ago. Art in whatever form is a bit like riding a bike, you never loose the skill. I love all forms of art, whatever medium, I have no favourites, people say to me when they see my stuff “ what, did you do that ? and that? “ because I do a bit off everything. Graphic art is where I tend to gravitate too, I’m a lover of black and white. Colour annoys me but I plod on. I’ve even renovated a large shed on my property and got myself a real studio, so now I have no excuses not to do art. I was very proud to be part of the arts trail last year, inviting 2 fellow artists along for the ride, and this year I intend to pull my finger out and do heaps of different works all in the name of ART. 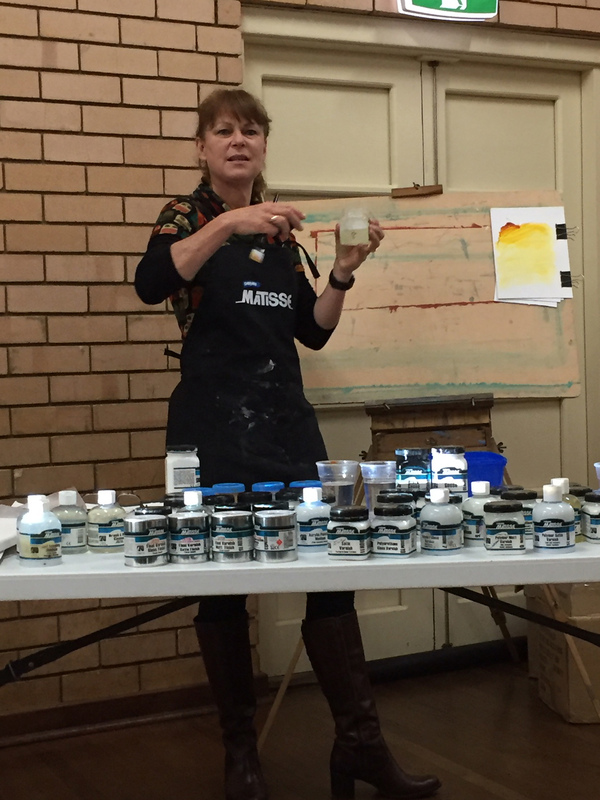 Kelly is a member of the Australian Ceramics Association and runs her popular class in Joondalup once a fortnight. She has been looking for a local facility for her Armadale Students and will use Art House on Hobbs regularly this year. Kelly said “she is happy to have ASA Members join her class when space available. On average she has 4 regular students but the maximum would be 7 students in total’) we will put a notice on the board in Club Room when available space. 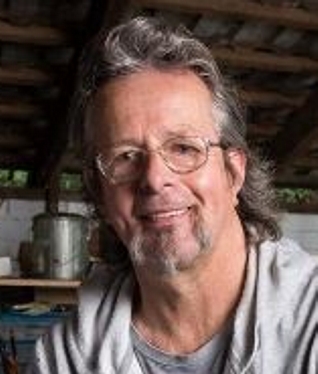 All material, tools, firing, glazing instruction and inspiration inclusive at $70/session. Pm for more info. Dates are as follows. 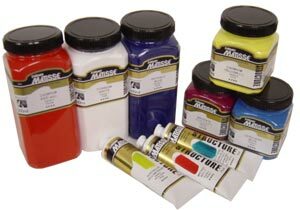 EVERYTHING SUPPLIED including the resin, boards, inks, paints, dusts etc. 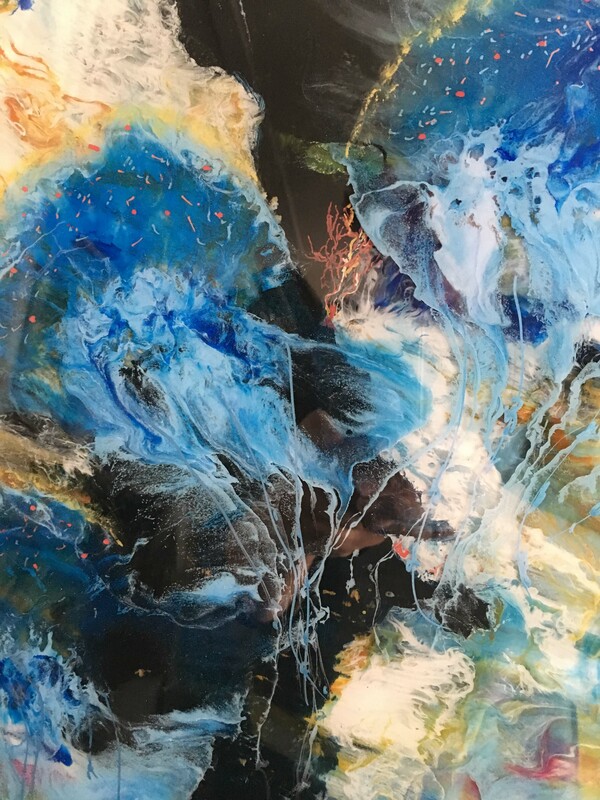 below is part of a painting called “TURMOIL” worked in layers of coloured resin with handwork between layers. We are pleased that our regular classes have resumed again for this year. We have updated our class schedule for your information and currently producing a flyer for each class to use for promotional use. If you are interested in running a class we have space available on Tuesday afternoons, Fridays am or pm and Saturday pm. contact Trish for more information. 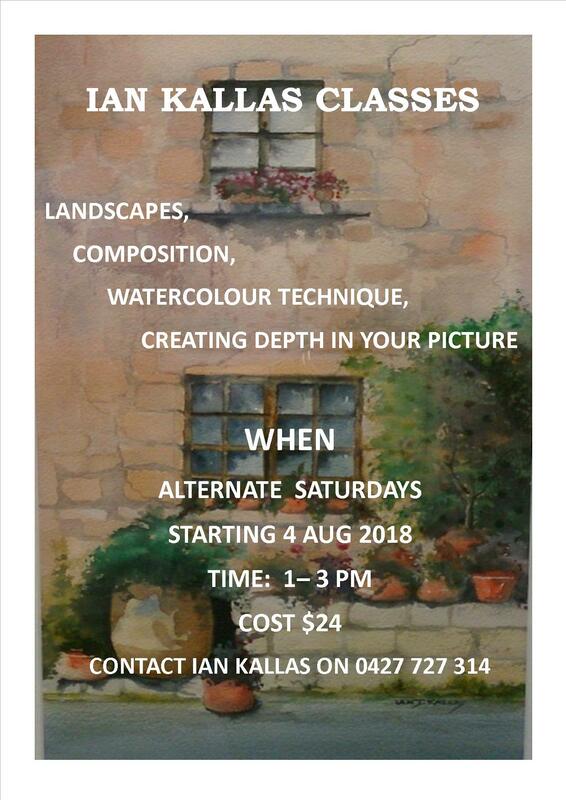 Regretfully for ASA members, Ian has decided have a break this year from running his fortnightly Saturday Watercolour classes. Thank you to Ian on behalf of ASA for all your support and time given to our members in running your classes and workshops. We would love to see you back again in the future. Good luck with your new ventures. ASA were fortunate to be in a position to apply for a Lotterywest Grant for a St John Heart Grant for a Defibrillator. This piece of life saving equipment is valued at $2,000 and 1000 Defibrillators were being offered to Community organisations to be part of the St John Community First Responder program. We have been approved fo the Defibrillator now waiting on more information. The Defibrillator will be in a locked box located under cover on the outside of Art House on Hobbs where it must be available for community emergency use. We will be given the necessary training in due time. A big thank to Jim for his time in applying for this Grant. 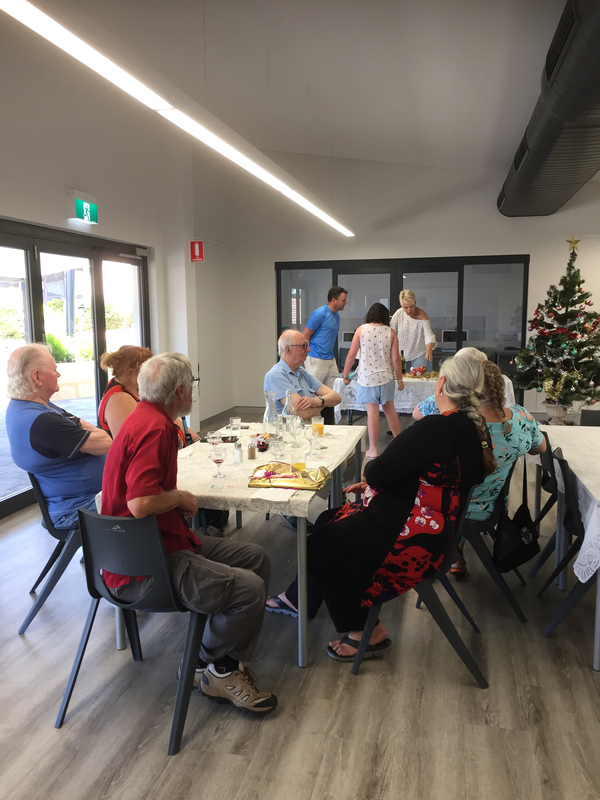 ASA and Dale Cottages Management hosted a joint morning tea recently on 23 January 2019 at the Greendale Centre followed by a site inspection of Art House on Hobbs. 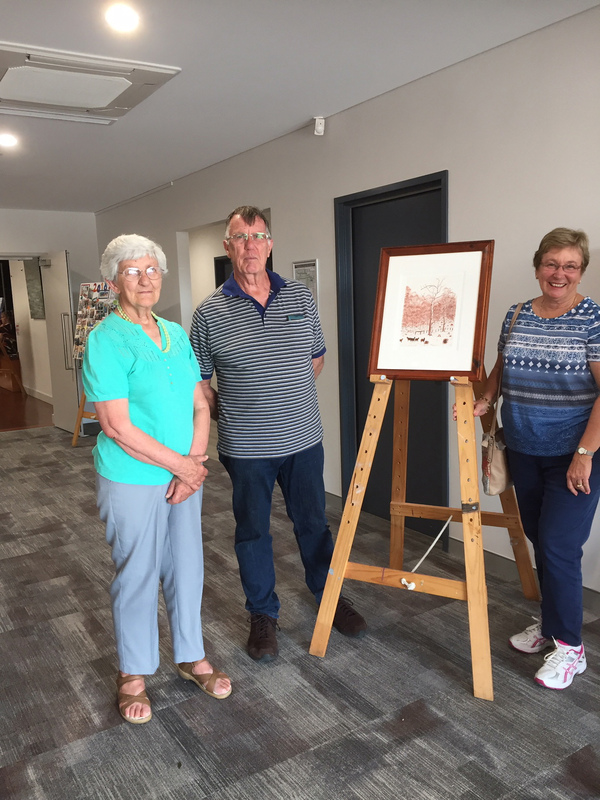 Thank you to Dot for providing the Devonshire Scones and to Sandra Reynolds and her Informal Group who allowed the Dale Cottage Residents a chance to see artists at work. We are keen to welcome residents of Dale Cottages to join in on our weekly classes and any other planned activities held at the Art House on Hobbs throughout this year. Clean up and dismantling Sheds at the old Art House and Gallery on Railway Ave. A.S.A. raised $1540 from the sale of the sheds. Thanks to all our members who helped with the clean up. Very sad to leave it but we are now embarking on a new and exciting journey at our new Art House on Hobbs, as our president, Trish says, onwards and upwards !!! is being held from Friday 18 to Thursday 28 February. We have once again been provided space near the Target end of shopping centre for our display. We have allocated all entrants a dedicated space of 90cm x 120cm (half a screen). In that space you have a choice of hanging whatever size artwork you would like and if you sell a piece you can replace with another. Membership fees are due on 1 February 2019 and payable from now onwards. Membership fees can be paid at the AGM and we will be there to take payments from 6pm until the AGM commences. We are asking ALL MEMBERS to please complete a new membership form this year. Hard copy is at Art House on Hobbs or you can download on “members only section” on ASA website. I am contacting you from Genesis In The Hills in Roleystone. You may already be aware that we offer our cafe as an exhibition space for local artists in month slots (We do not take commission). 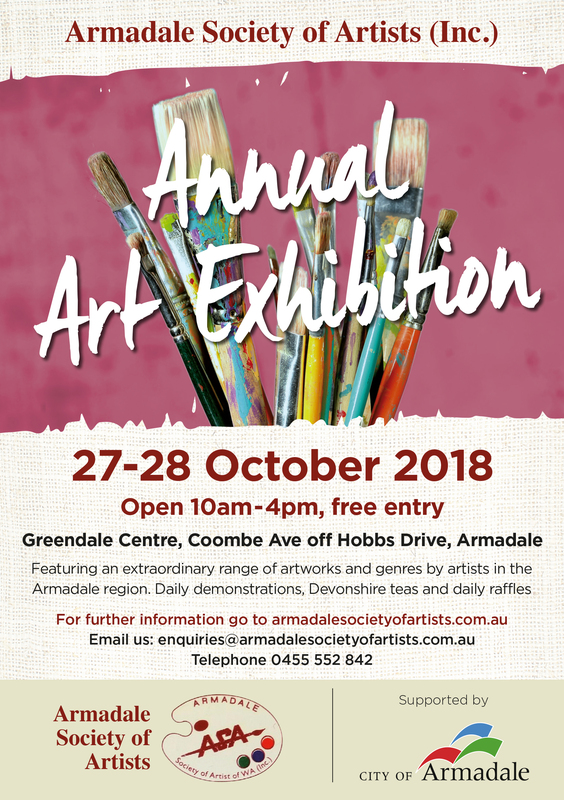 I was hoping to send the word out to those artists who are a part of the Armadale Society of Artists to ask if any would be interested in exhibiting their work here in 2019. February is our next availability however if that is too soon I can also book in for later in the year. If you could please contact me via this email or at the cafe Thursday to Sunday on 9397 7799 if you are interested. I am very pleased to say that our website is going from strength to strength, we have had quite a few new members adding their work and with regular postings of newsletters and blog posts it is showing very well now on the search engines. The more content we have and notices we post the better it is. 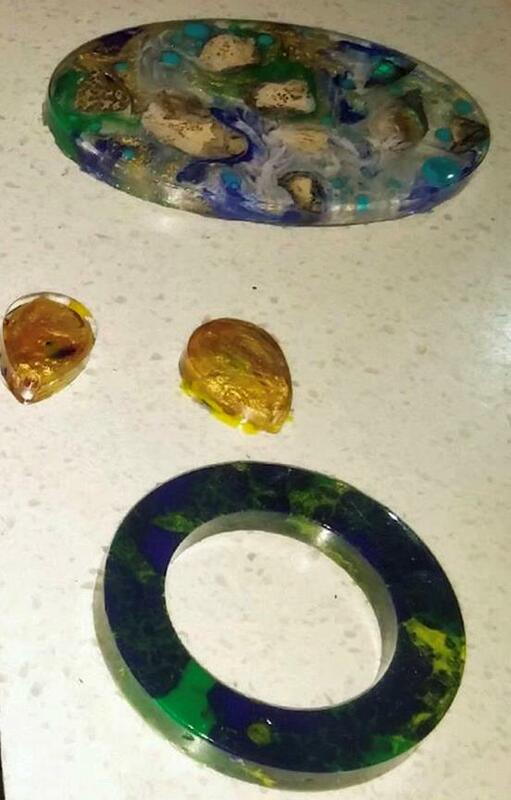 I have personally had a commission directly from the site and an enquiry for a resin workshop that I ended up running in February, this was also as a result of someone typing in the words “art workshops”. Of course whilst people are on the site looking for classes and workshops they also look at our artwork. 4 OF THE RAFFLE WINNERS AT THE CHRISTMAS MEETING, A LOVELY MEETING WITH YUMMY CHRISTMAS FOOD. 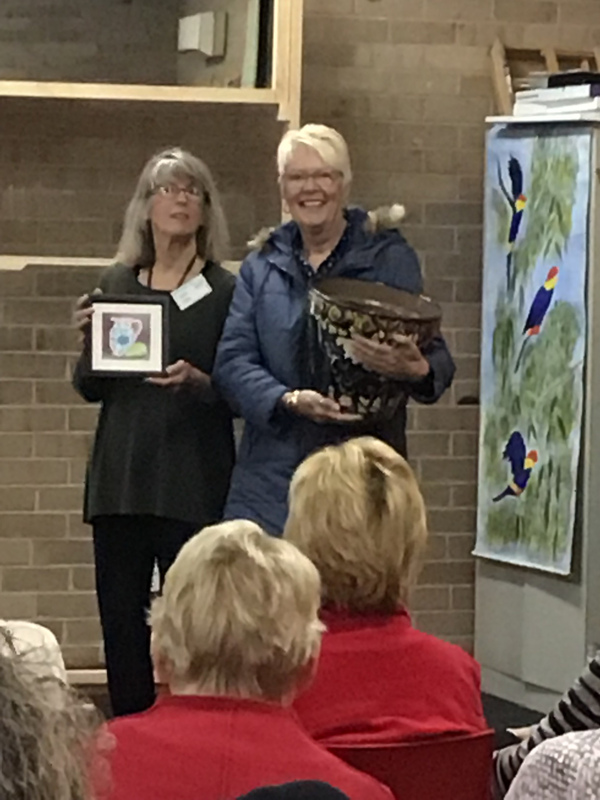 "A competition was run by Perth Hills Armadale Visitor Centre, This competition was to encourage people to celebrate Arts and Culture in the Perth Hills Armadale. To enter, participants simply need to upload a photo to facebook or instagram showing what they love about Arts and culture in the region. 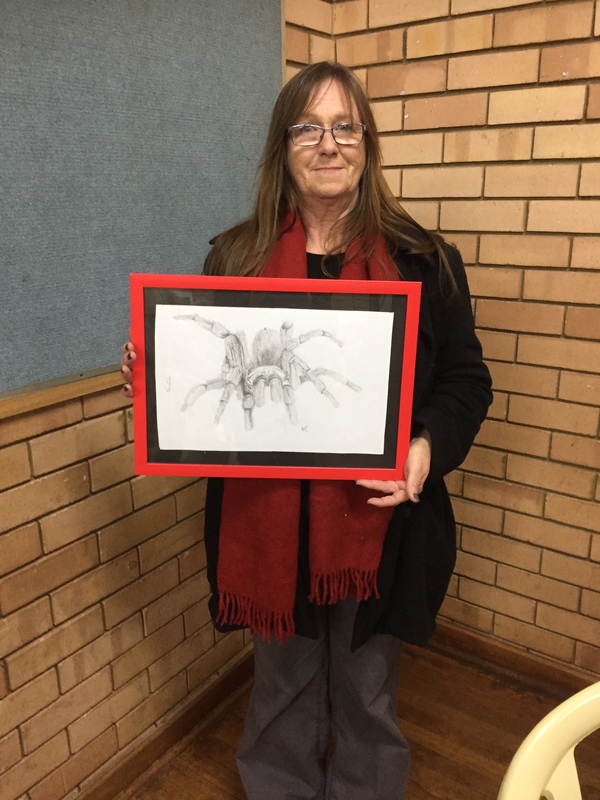 The major prizes were two iPads, and other prize consisted of 1 x $100 voucher to spend at the Art House and Gallery which allowed the prize winner to choose a painting to the value of $100 off the ASA Website. 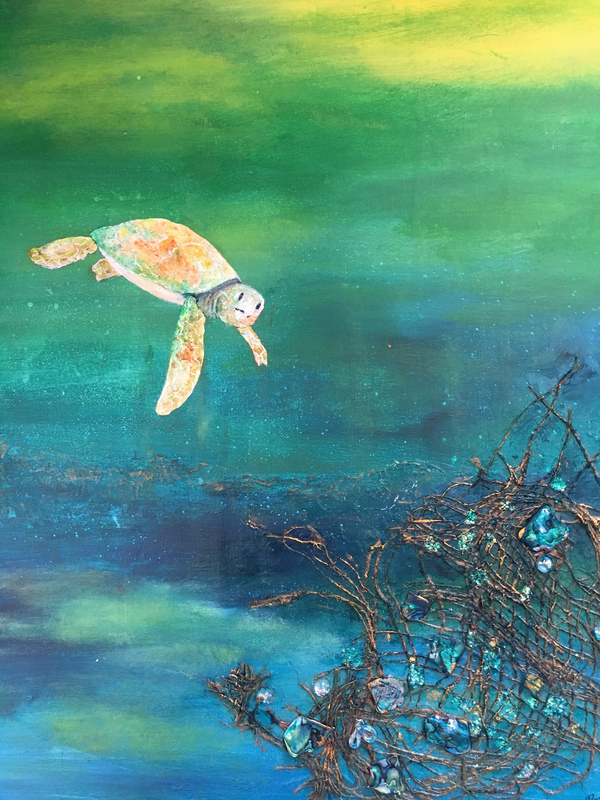 The winner chose Dot Marshall’s painting of a Turtle, Called diving for treasure off the website and as it was already sold Dot was commissioned to paint another which they happily now have in their home. The Culture Lover Competition commenced 26 June and finished Wed 31 August 2018. It is with great sadness that we have to let you know of the passing of one of our much loved members, Vera Glover. Mum to David and Lynda Glover. Vera was a wonderful lady and we remember her with love especially those of whom enjoyed her company and great sense of humour at art classes. She never failed to amaze us with her enthusiasm and willingness to “have a go” at everything. She put us youngsters to shame, she was almost 98 when she passed she was still just as sharp. Dot’s husband, Howard called her an English Rose, and she was a true English lady with the most beautiful English Rose complexion. She loved her garden and flowers so instead of putting a sombre border around this notice we have found some lovely cheerful flowers I think she would have preferred that. Welcome to the last society newseltter for 2018, it has been a very busy year with huge changes for the society. I hope you enjoy reading this newsletter and I wish you all a very Happy Christmas and the very best for 2019. This is the time of year where we celebrate the year that was and prepare for our festive season and the new year. 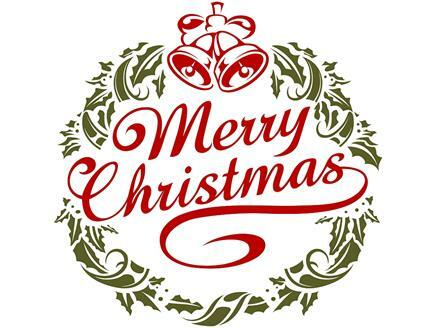 On behalf of our ASA Committee we wish you all a very safe and happy Christmas and New Year. We have two Christmas events coming up that we hope you will come along and help us celebrate. 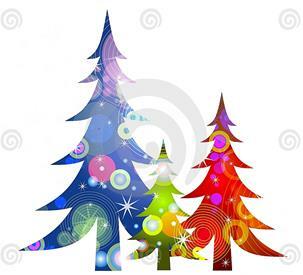 our Christmas Monthly Meeting and Supper on Thursday 6 December. 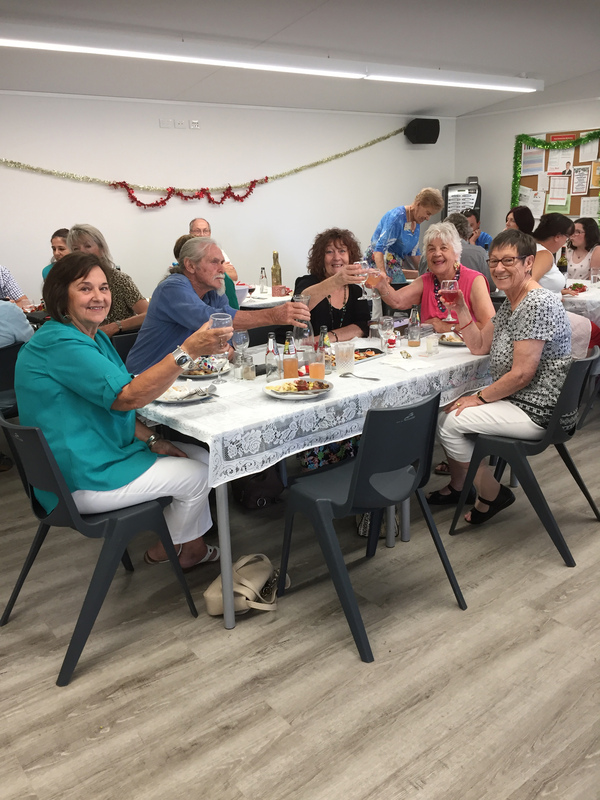 and our Christmas lunch on Sunday 9 December, being held in the Greendale Centre Dining Room, details are inside the Newsletter. This is a good chance if you have not yet seen the Art House on Hobbs. We will be open from 10am on the 9 December if you wish to view. 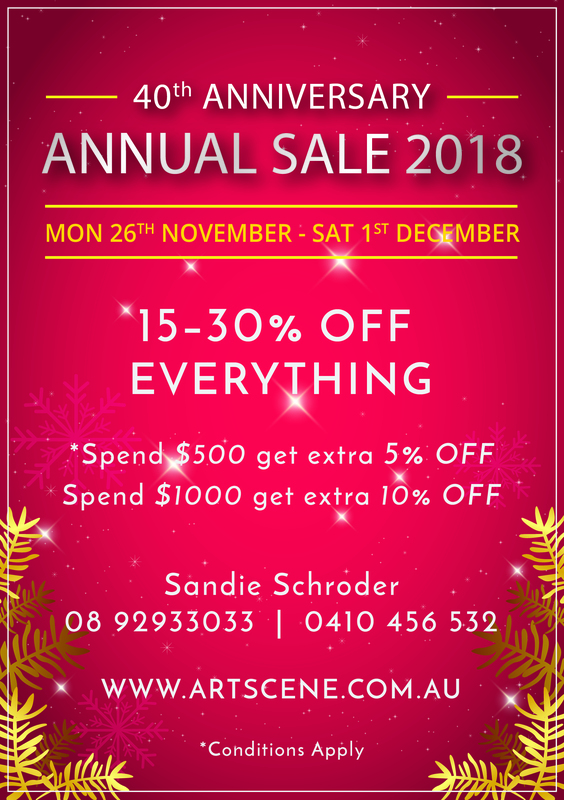 One of the major highlights this year would have to be the ASA Pop-Up-Shop in Armadale Shopping City, that we successfully ran for an amazing nine month period. 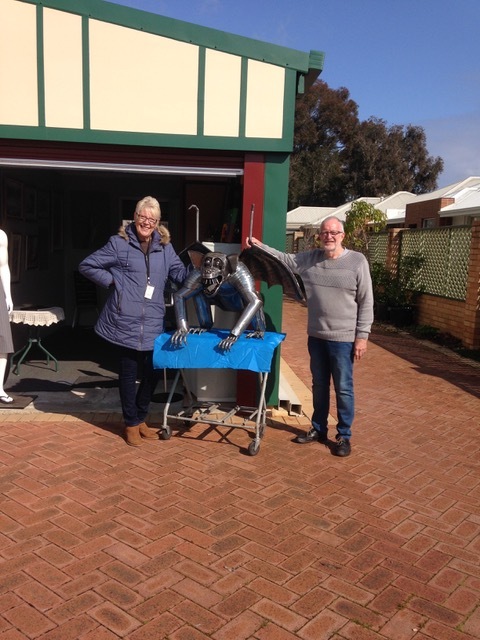 Another was moving from the Art House and Gallery Kelmscott to our ASA’s new home at 4 Hobbs Drive Armadale. Dot Marshall is planning to write a history of this 10 year period and I am sure this will be of interest to our members. 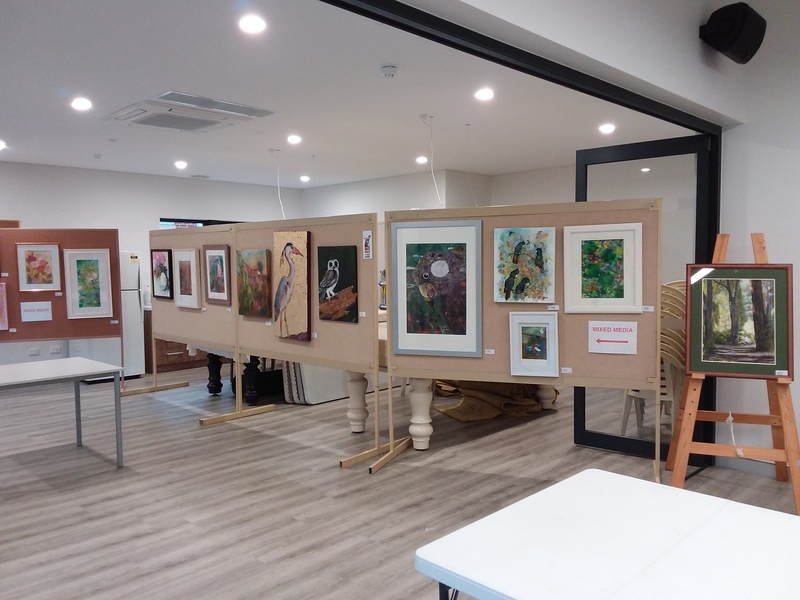 Our Annual Exhibition was very successful this year at the new Greendale Centre. 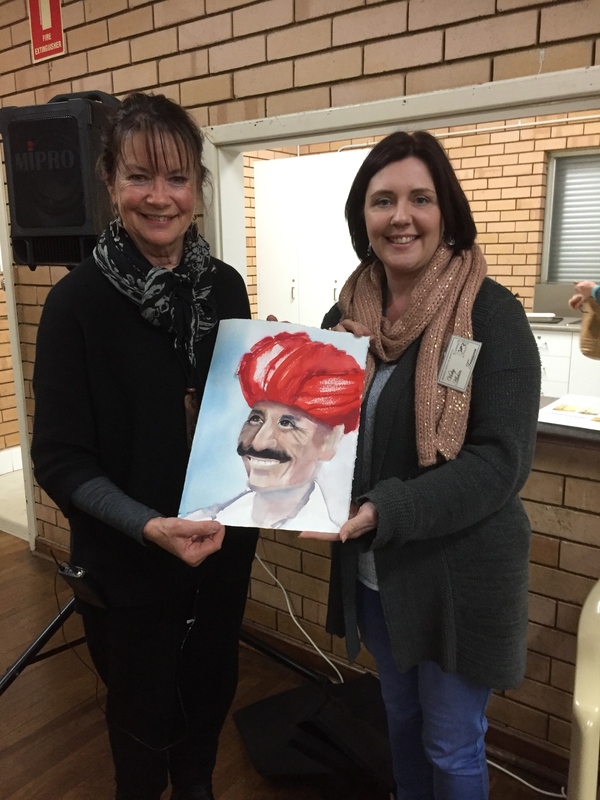 This provided ASA with a great venue to showcase ASA Members’ Artwork and to host our Annual Awards night. Congratulations to all our winners. We also spare a few thoughts for our Members who have not had such a good year with health or hardships. We are thinking of you and hope that 2019 is a better year ahead. 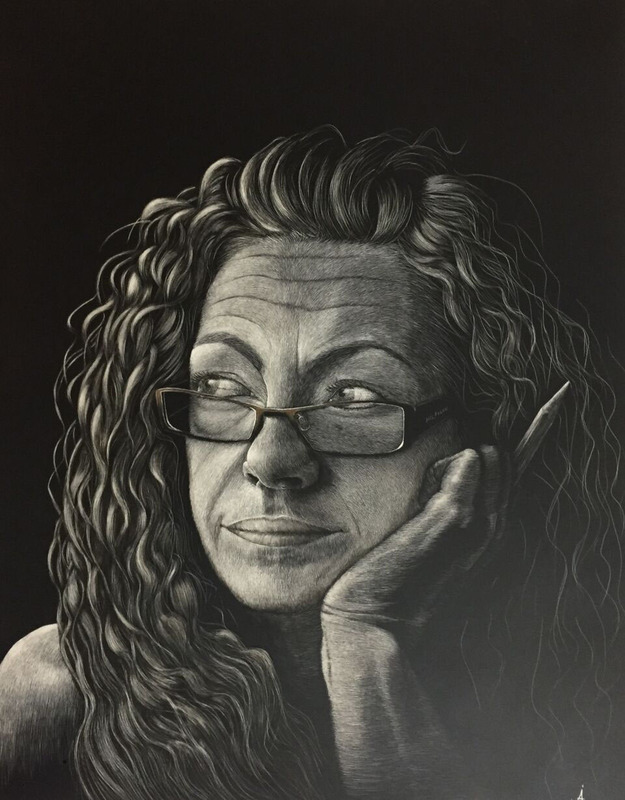 We would like to thank our November Demonstrator Julie Fearns-Pheasant for her interesting insight into using Digital techniques in creating her latest Figurative Art Series. 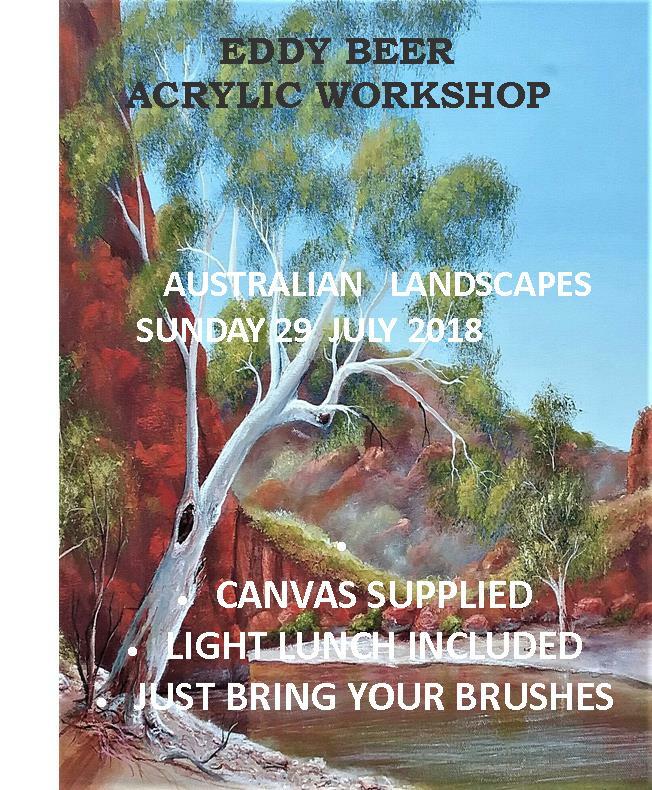 If you are interested in learning more about Digital Art Techniques let us know as Julie is happy to run some workshops for ASA in the future. Last months winner of the “Still Life” Challenge was Lynda Everett who won one of Julie Fearns-Pheasant’s illustrated planter pots. 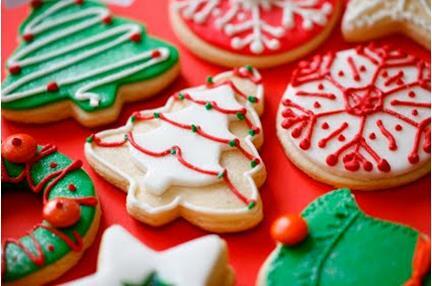 This is the last meeting for the year so we are planning a Christmas celebratory supper. Display of Art Supplies and Books for Christmas gifts on display and for sale. Creativity has always been a big part of my life, being a hairdresser, I have to be creative to a certain extent every day, so becoming an artist was a natural progression for me. My husband and I emigrated from the UK almost 25yrs ago, to be closer to family. We had only been here 5yrs when my mum passed away. 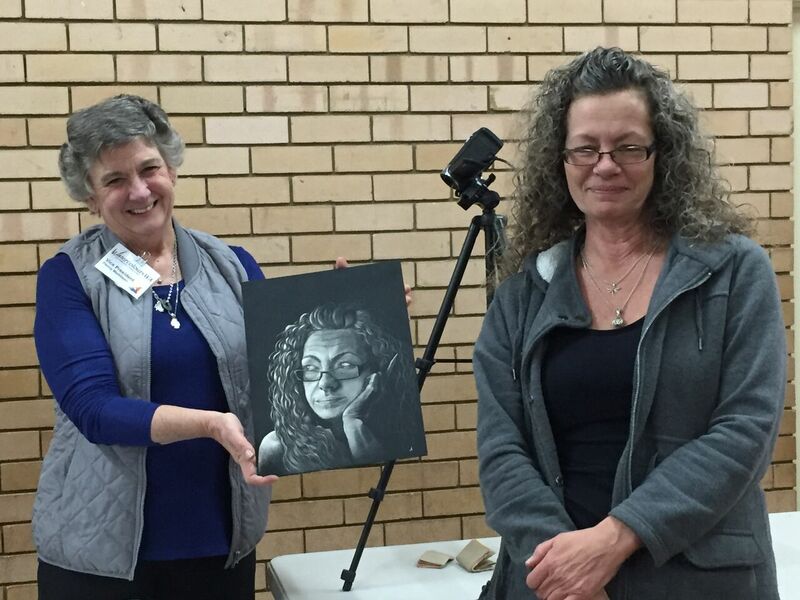 On our first family holiday without her, my sister, who had done a workshop with Carl Haanappel, brought out some charcoal and paper. The urge to start drawing was too strong, I was hooked pretty quickly, and the rest as they say is history. 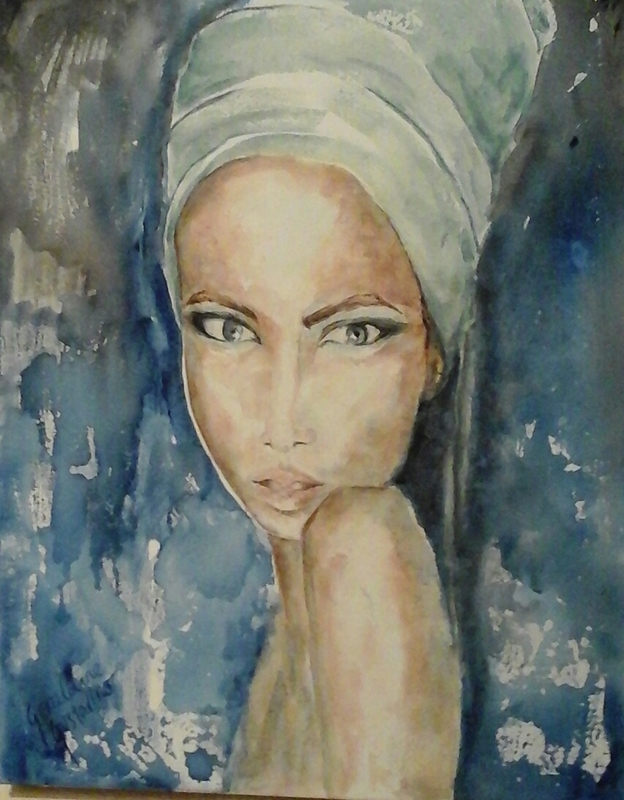 I started my art journey with water colour, progressed to acrylic, pastel and Textile/ mixed media. The latter being my medium of choice. The fabric I use is calico, Silk or silk like materials. I like the different effects I can achieve from different fabrics. For added texture I glue tissue paper and thread to the fabric. I drop different coloured inks on to it, and when it is dry go over with gold acrylic paint. This forms the background of my picture. 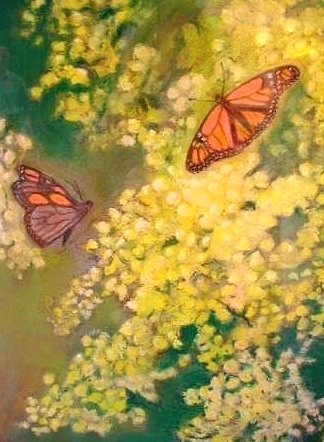 Flowers and butterflies made from fabric, thread, paper, wire and beads, quite often become part of the foreground. As well as being a member of ASA, I am also a member of Liddelow where I go to do pottery, mainly hand building. We are having our annual exhibition, starting Friday 30th November, (opening night.) This is the piece I am working on for that. ‘Golden glow’ Hand built/mixed media. My easel has this Acrylic mixed media painting on it. I have been working on this piece for awhile. ‘The Bungle Bungles.’ It started life as an acrylic painting, pure and simply, but I got so far with it and wasn’t happy with the foreground. I enlarged the rocks and started adding texture. There’s still a lot to do on it before it is finished. It’s a work in progress. I am just waiting for inspiration to finish it off! 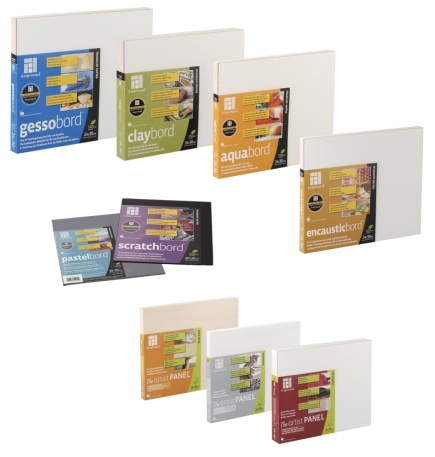 I am also working on some covered notebooks and cards, to take to Liddelow for their shop. I did well with sales last year, so fingers crossed for this year too. I wish you all lots of creativity and happy painting. 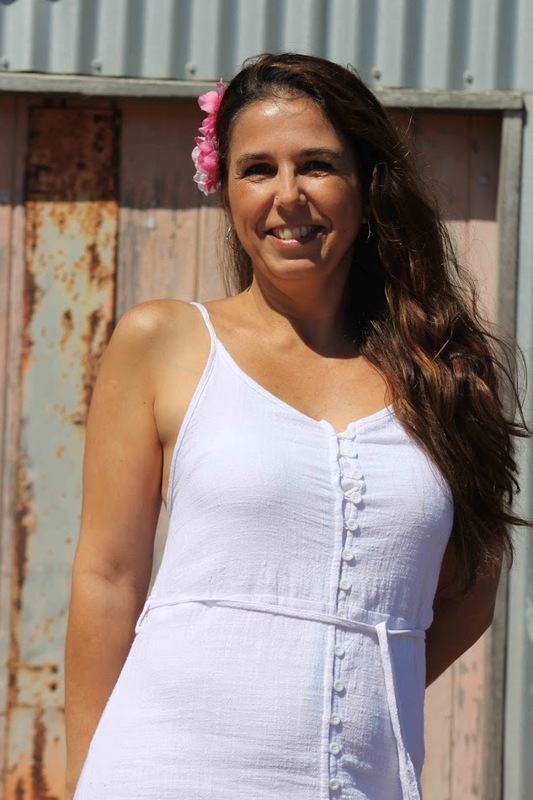 Our very popular GERALDINE GUSTAVINO is going to do a workshop the Dancing Beauties. Having moved into ASA’s new building in the midst of the Annual Exhibition we are happy to say life has returned to a more normal schedule. We are now planning how best to move forward in the planning of activities at Art House on Hobbs. We are fortunate that our Kitchen and Bathrooms are serviced twice a week by Management of Dale Cottages. However we do need to keep the rest of the building clean and tidy. We have placed some everyday Housekeeping rules for your information displayed around the building. It is vital that the Teacher/Informal Group Leader of their class, and the Club Room be left clean and tidy, ready for next class to enjoy. Exit Check Lists have also been placed near the exit doors as a reminder to Lock all doors securely, turn off lights and air conditioning units before vacating the building. We are calling on ASA Members who would like to be part of our Art House on Hobbs Sub-Committee Team. The ASA Committee feel it is important to have a separate team of Members who feel they can contribute by offering fresh ideas and to share the work load on the day to day running of Art House on Hobbs. Vicky and Trish will be part of this sub committee as the financial and marketing support. If you would like to be part of this team please contact Trish by email: [email protected].or phone on 0455 552 842. We are planning to Sub Lease the top floor rooms and are preparing a flyer to be distributed. Before advertising to the Public we wanted our own Members to be advised of our plans to sub let the upstairs rooms. This is a great space for a small professional business or some one in the Music or Arts Business who are looking for business space. If you are interested or know of someone please contact Trish on 0455 552 842. 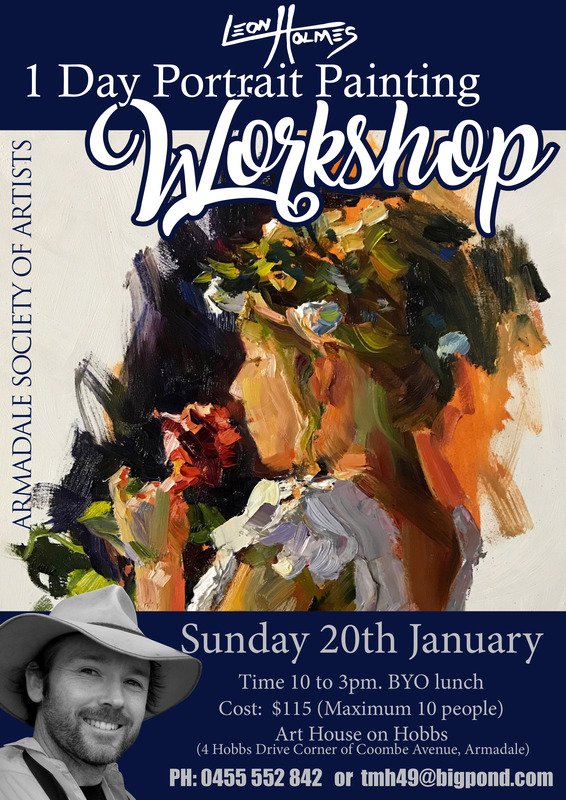 ARMADALE SOCIETY OF ARTISTS INC. 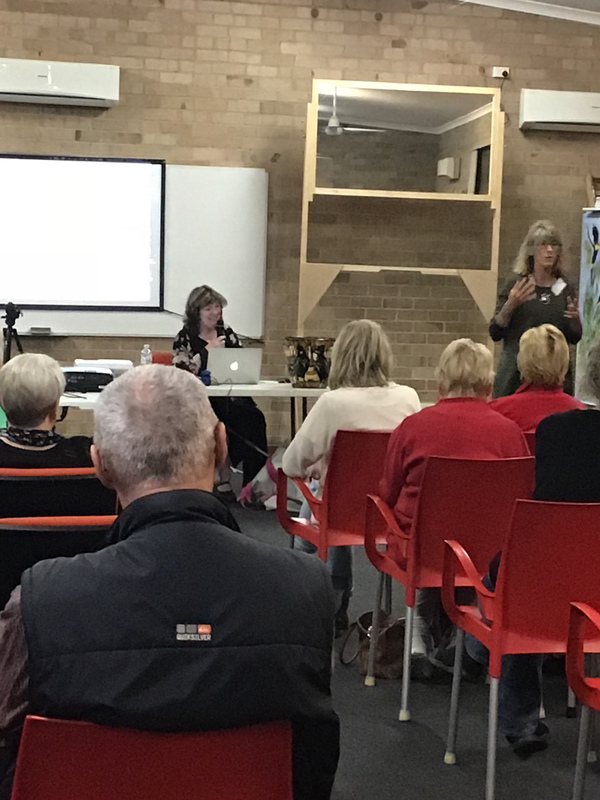 The Treasurer, Vicky Alchin, presented a report on the Exhibition Statistics for the weekend, showing a total number of visitors over the weekend to be 506, with a total of $1,931.50 being raised across the weekend from Devonshire Teas, raffles, Catalogues and donations and with costs deducted, left a total of $1,789.70. Having the Exhibition at the Greendale Centre was a saving in Hall hire fees, and it was noted that having the hall for 4 days was an advantage for all those setting up and dismantling the exhibition and suggest trying to do the same for next years’ exhibition. The Sub Committee in charge of the Exhibition did a sterling job as did Frankie Maher, who co-ordinated the food for the opening night. Thanks to all involved. Our AGM will be held at our First Members Meeting on 01 February 2019 - Our current Committee will be stepping down and nominations for a new Committee will be called for in January 2019. As we have moved to our new premises Art House on Hobbs and our overheads will now include rental costs. Unfortunately our ASA fees will be increased for 2019. Our Annual Fee will now be $75 starting from 01 February 2019 valid to 31 January 2020. Due to the Constitution rules for all Members including Life Members we will need to complete a Membership Form to ensure our data base meets the requirements. 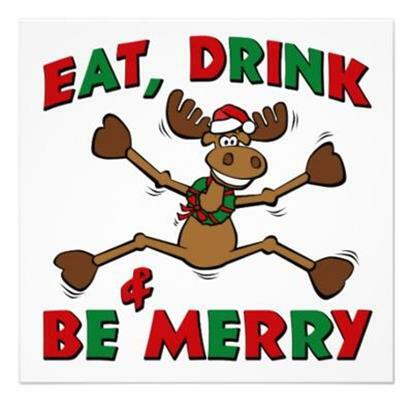 Our ASA Christmas lunch this year will be held at the Greendale Centre, in the dining room. 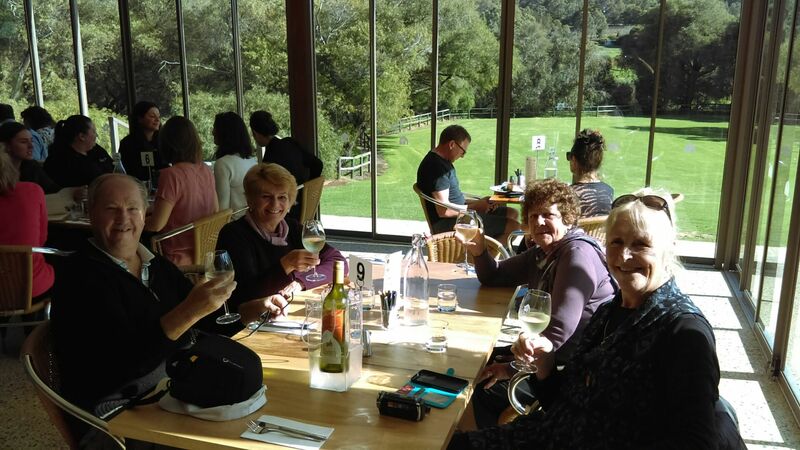 There is plenty of room to enjoy a relaxed lunch to finish our busy year. Please bring along a plate of food and ASA will provide the wines. 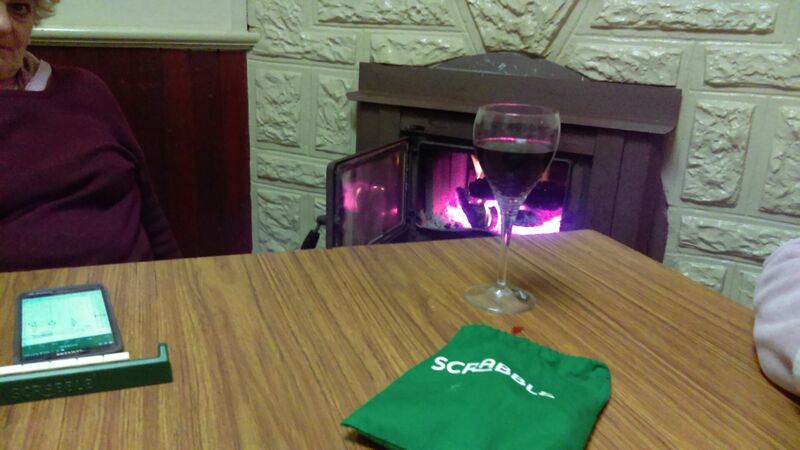 To add to the fun we are hoping you bring along a Secret Santa Gift (unisex) to the value of $10. Partners are, of course welcome. Who is going to win this raffle ?? 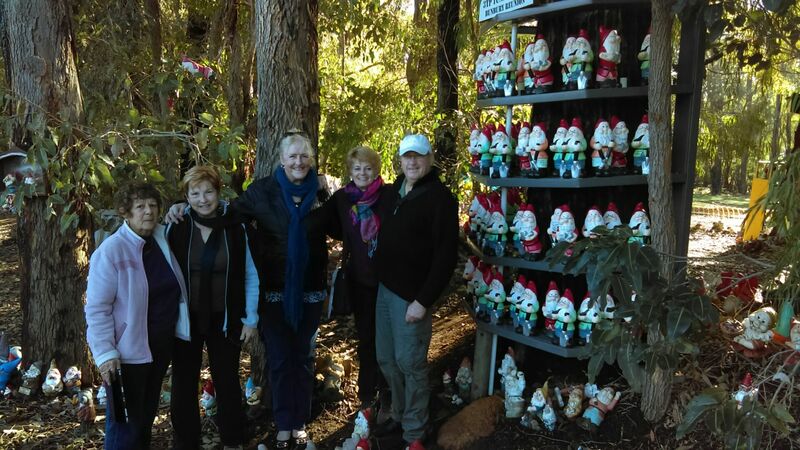 Carol Joy’s very talented group had an extremely succeful exhibition once again at the Stargate shop cent. The Art House over the years holds many memories for our members and past Presidents and Committee’s. It has provided us the opportunity to run our classes and workshops, show our art and hold many get togethers on special occasions. So let’s take a minute to remember all the good times and the people who have made the last 10 years happen for ASA. The opportunity to have a Society home does not just happen everyday. We were given an incredible opportunity for an Art Group like us to have a building to call our own. MRA provided ASA with this building and our contact over the years has been Patrick Ward and his staff. They have provided the ASA with the support on any issues that have arisen and made sure they were taken care of. So we want to say thank you so much. Our move to the new building went well over the weekend of the 13th October with the packing up of the old Art House and the help we received from our members with trailers and generous spirit going back and forth. Still lots to do but MRA have extended some time for us to continue on finalizing our move without rushing. 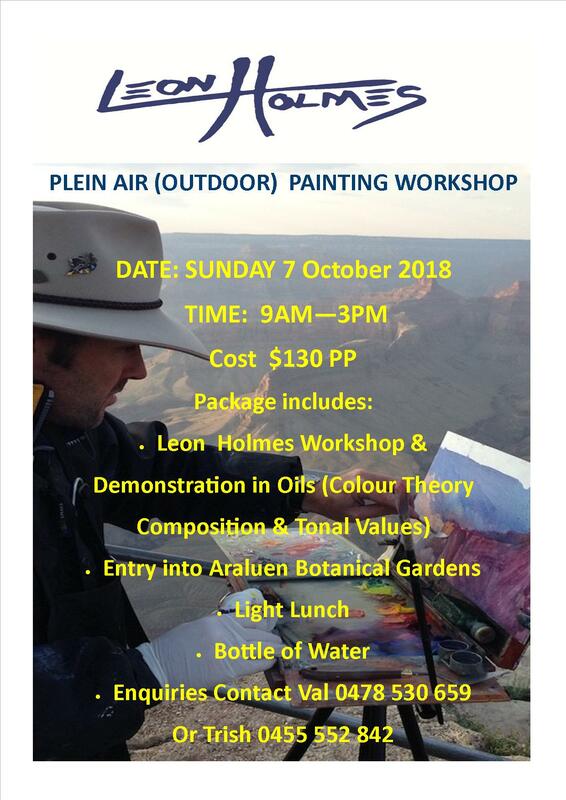 Our Leon Holmes Workshop held Sunday 7 October at Araluen Gardens was a successful day for all who attended, the weather was kind and the lunch was yummy. Leon gave a great demonstration and a introduction to Plein Air Painting. 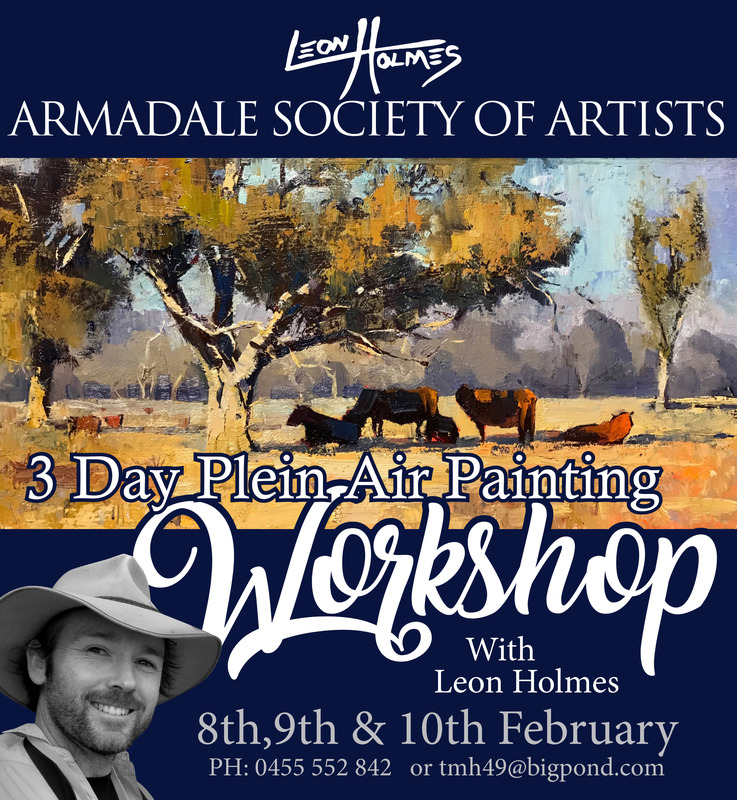 We would love to see more of Leon workshops in the future, he has offered to conduct a three day workshop for those interested in the new Year. Good luck to you all our Members entering this years Annual Art Exhibition here hoping for a successful weekend and that we get lots of visitors. 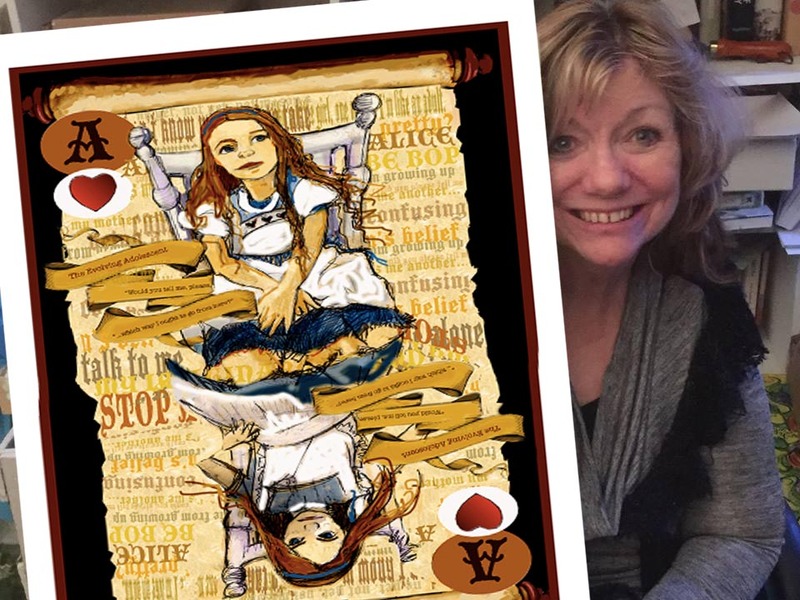 Julie Fearns-Pheasant, figurative artist/illustrator and educator, takes us on a digital voyage of discovery, showing how she developed Alice's whimsical journey through the rabbit hole. 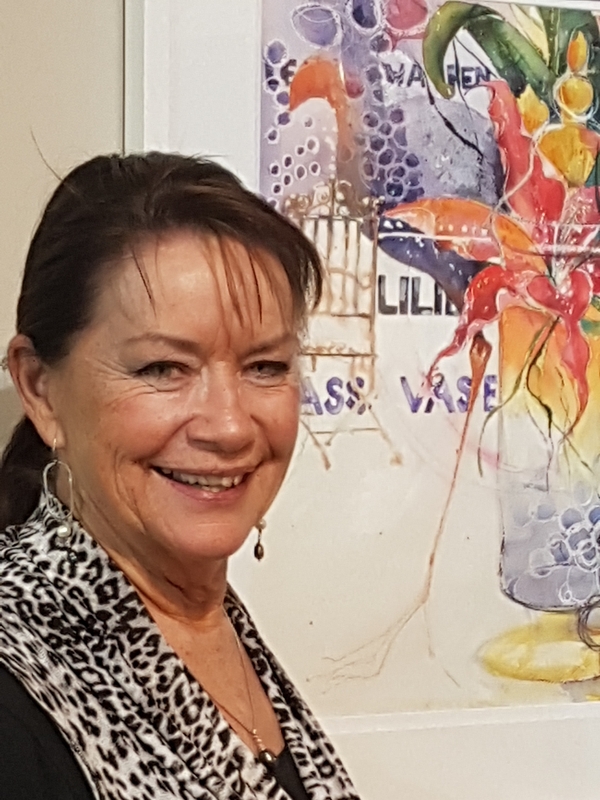 We would like to thank Sandie Schroder for her informative presentation on “all things acrylic” last month and thank you to The Art Scene for our Matisse visual diaries that every member present received. Winner of the challenge last month was “Boats” Dave Archer. Art has always been a part of who I am. I was very fortunate to have been able to get involved with painting and drawing at a very early age. When I completed high school, I went on to study at Canterbury Art School in England, where I did my foundation course in art and design. Shortly after I met my husband and in 1994 we immigrated to Australia. By then we had a young child and soon after a second, so art was unfortunately put on the back burner whilst I concentrated on being a mum and working full time. But art was always at the back of my mind and after what seemed like an eternity I was very fortunate to meet a great group of likeminded people. 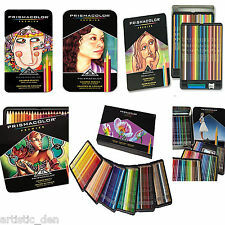 I attended painting classes with them and soon we all formed a close friendship. 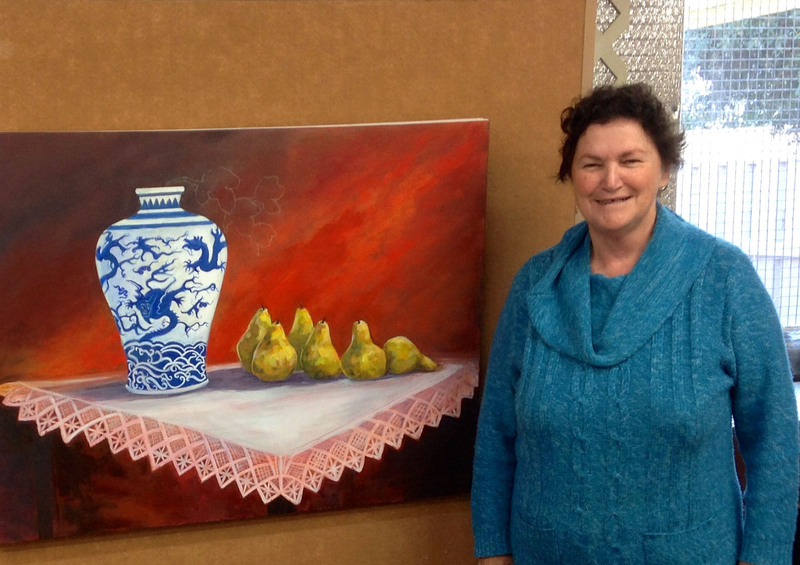 In November 2015, I exhibited in my first exhibition in Australia, “ Picturesque “ held at the Moving Art Studio in Fremantle . 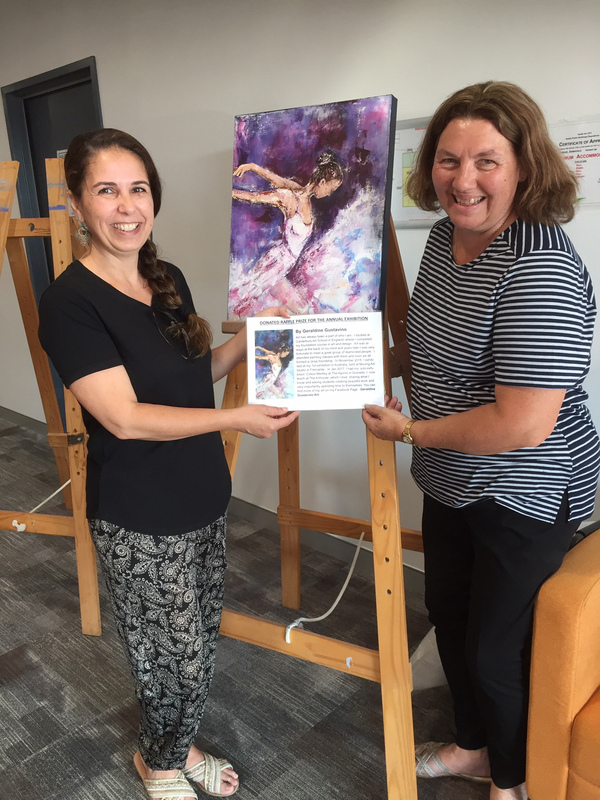 In Jan 2017, I had my second solo exhibition, “Colour Medley” at The Agonis in Gosnells. 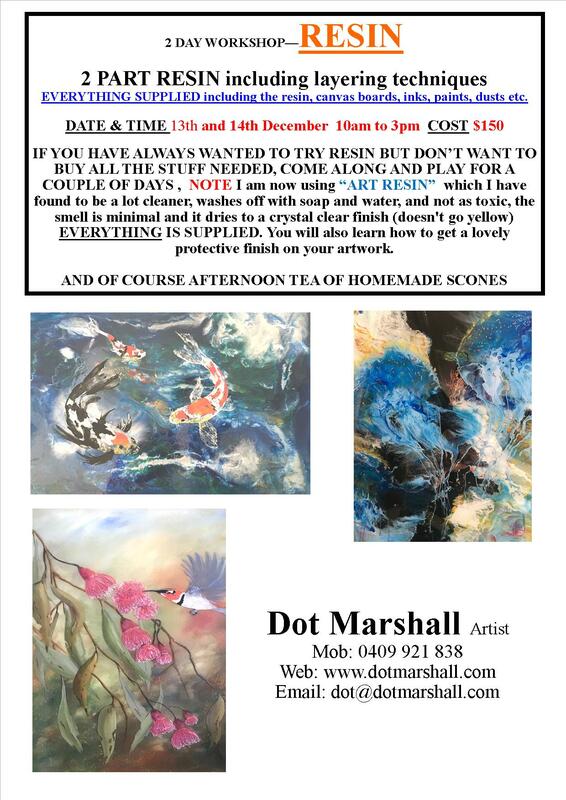 Since then I have been teaching acrylics and mixed media at The Arthouse every second Sat. It always gives me great joy to see my lovely students enjoying their time spent creating beautiful work , BUT most importantly, spending time to themselves. Art is therapeutic, it allows our minds to let go. So what else have I been getting up to? Well, my easel is on fire!! It has seen canvas after canvas coming to life as I prepared for our Annual Art Exhibition in Oct, and as I get ready for yet another exhibition in November at the Memorial Hall in Hamilton Hill. “Seven Shades” sees seven artists come together for the first time . My work in this exhibition is soft and feminine, through the images and colours. 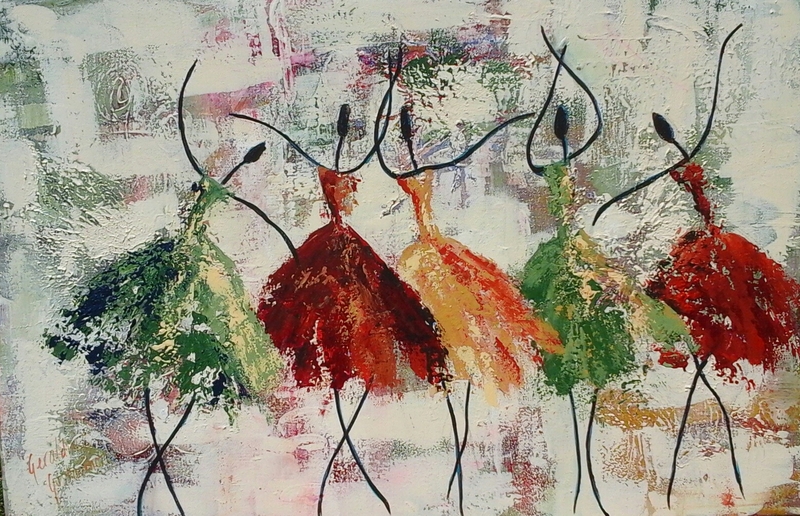 I have explored different styles, some with strong strokes of colour and movement and others softer and more subtle. There are times I enjoy and love letting go and allowing my paintings come to life intuitively, but then there are times I also like knowing where I am headed. I suppose we all know what is right instinctively at that moment. There are so many possibilities out there for all of us, all you need to do it reach out and grab them. The Greendale centre are having an open day Thursday 8th November and we are able to have a small display, so it will be a great opportunity to network and get to know the residents of Dale Cottages. Parking will be at a premium on opening night (our ASA car park will fill quickly) there is street parking on Hobbs Drive and side streets around the Dale Cottages on the corner of Church Avenue there may be some spots in the Citizens Advice bureau Building. 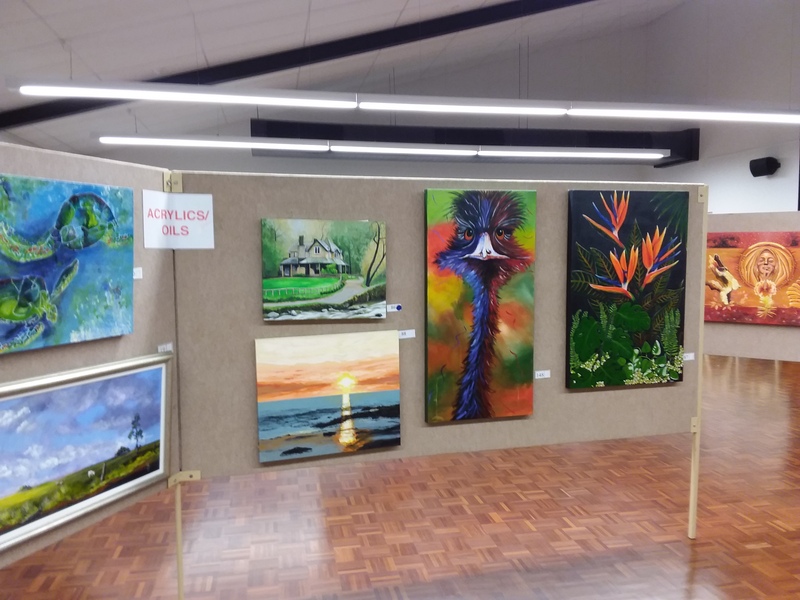 Drop your paintings to the lesser hall at the rear of the Greendale Centre, Coombe Avenue Armadale (we will have arrows to point the way no entry from reception) if you have a problem getting to venue between 10 to 12 time slot please phone Jim on 0400 370 089. Frankie has requested a reminder to all Members. We are expecting a lot of people at the Opening Night of our Annual Exhibition. Each Member attending is requested to bring a plate of Savoury or Sweet food. If your food needs heating can you please bring it on a oven tray or dish and then we will transfer to our own platters for distribution. Jennifer Meyrick has been appointed onto the Committee as our Acting Secretary and Minute Secretary. 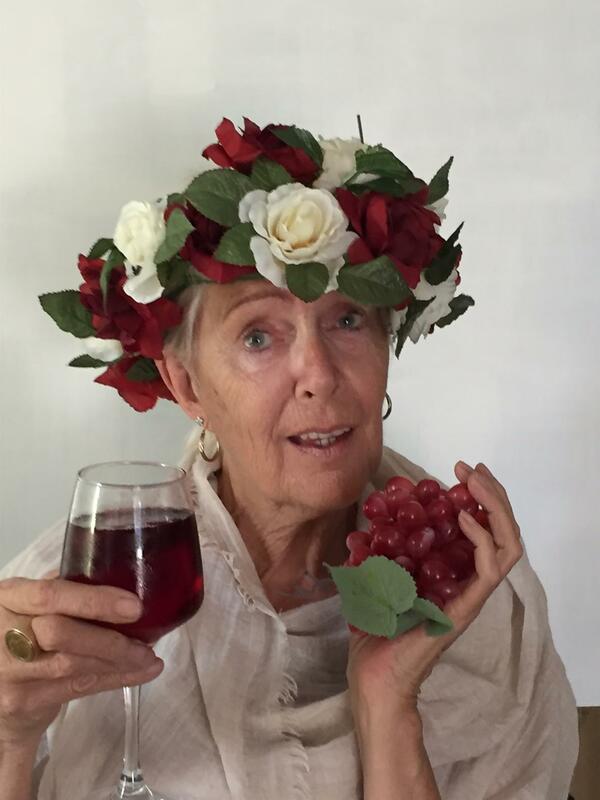 As our secretary , Helen Gordon has been very unwell and in Hospital for a number of weeks, she is apparently starting to improve albeit slowly. 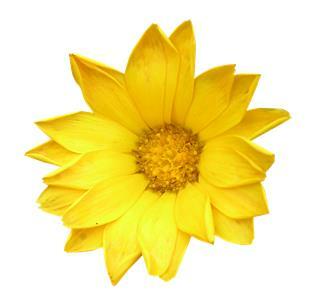 But we do send our love, best wishes and prayers to you Helen for your continued recovery. It is with a very heavy heart that we have to let you know of the passing of one of our very popular members. Jim Trapski who passed away suddenly at home. His friends at the society will remember him fondly as “Jum” because of his broad New Zealand accent. Our thoughts are with his wife Anne and their family. 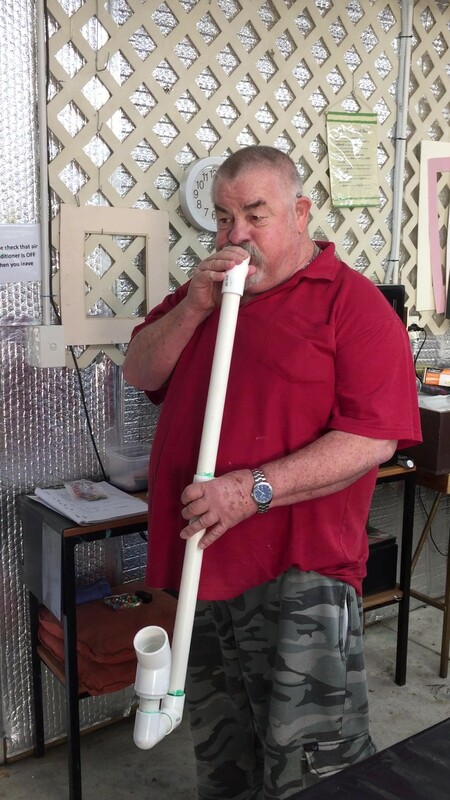 Jim is pictured playing his digeridoo made of plumbing pipes, a very funny man and very talented artist in many ways. All the best for speedy recovery to Sandy Spindler she has had a knee replacement surgery was successful and she is now at home being pampered by Eddie. Gill Goddard broke her foot and was operated on and is now recuperating, so a speedy recovery to her as well. Outside in the courtyard, Geraldine Gustavino, Janet Gardiner, Dot Marshall, Vicky Alchin. Very excited about the future in our new art house. The move to the new Art House will take a little time to set up practical guidelines for future smooth running. We are currently looking at all the feedback received from our Teachers and Members during the Site Inspections recently . We will have some new class slots available, and we are looking forward to extending class options for our Members and the Local Community. 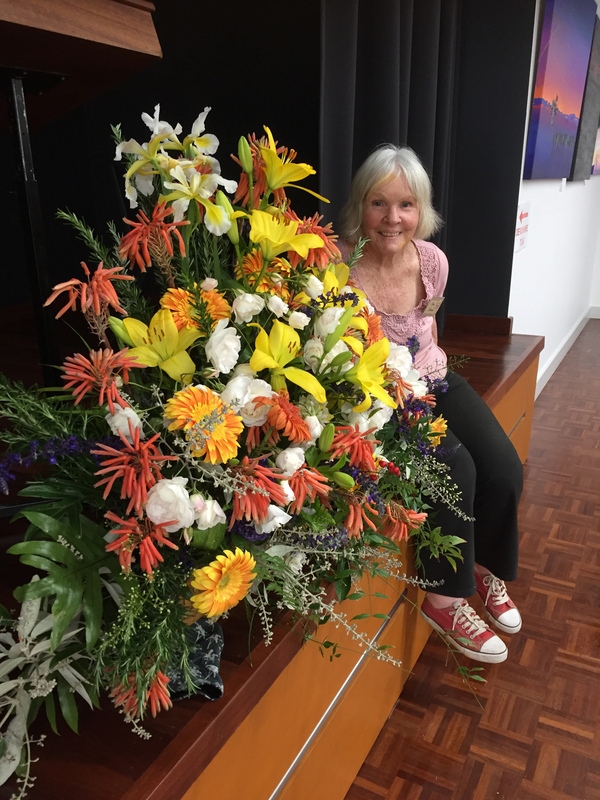 Val Mezger has just returned from holidays and is now back on board as our Art House Coordinator, for Classes and Workshops for the new Hobbs Building. Please direct any enquiries to Val regarding starting up new classes and workshops. Jim Halloran has been appointed onto the Committee as our Operations Co-Ordinator for the Hobbs Building for all physical building issues including fire plan and liaison with Dale Cottages on all Building Matters as well as his other volunteer roles. 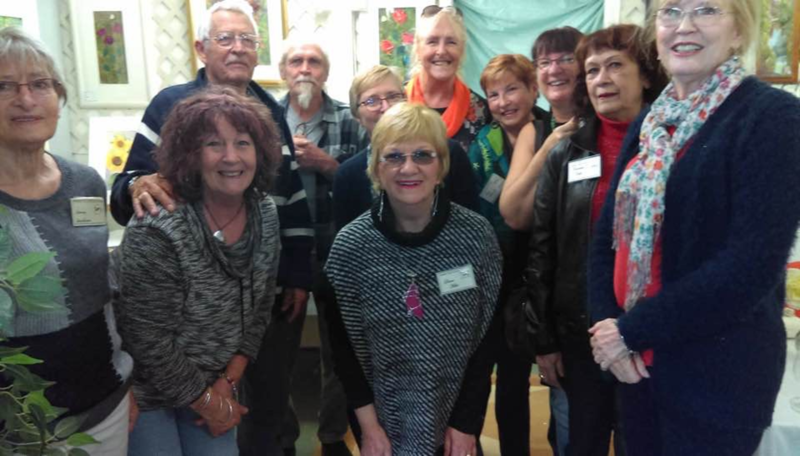 Dot will be writing a history of the original Art House, as with most of our members the bonds that were formed at our first ever home will stay with her for the rest of her life and she feels it would be sad for all the memories and stories to be lost. So if you have some anecdotes about the House that you would like to share please let Dot know [email protected] photos would also be great. There will be great prizes to be won and a trophy for the overall winner to take home. Our Sponsors have been most generous this year and you can see who they are, listed on the back page of this Newsletter. Two new sponsors this year are Subway Armadale and The Examiner. We would like to thank our Sub Committee Team - Ian Kallas, Geraldine Gustavino, Linda Glover and Jim Halloran for organising this years event. The Exhibition invitations were sent out by Paperless post and by mobile messaging. Hope you received your invitation if not you are invited to Opening Night. 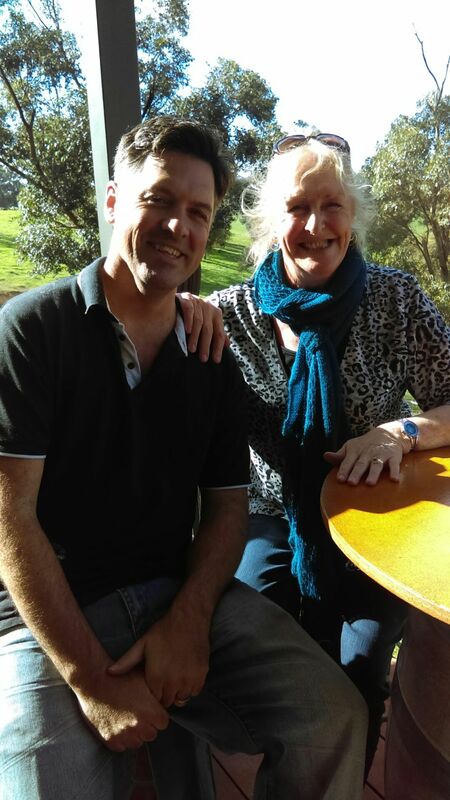 This was a first for ASA and we would like to thank Mary and Jim for their perseverance and time spent collating our data base and sending out the invitations. 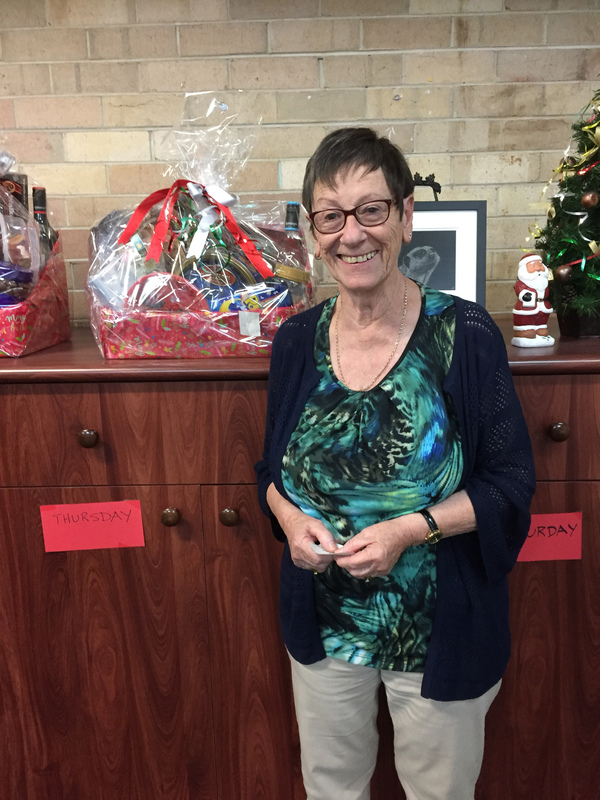 We had a some help from Sue Littleton from City of Armadale Mayor’s Office and we thank her for her friendly and invaluable advice. Our catalogue covers once again grace the front page of our Programs and we thank all our members who spent time creating and demonstrating their wonderful talents to create these amazing works. Thank you to Dot who has prepared this years Catalogue content and to Janet Gardiner for printing and coordinating folding of the catalogues. We thank all who attended our Collating Catalogue day on Sunday 21 October. Delivery of Artwork - Thursday 25th October to the lesser hall at Greendale Centre from 10 am to 12 noon. Directional arrows should be up to guide you to the correct entry to drop off your artworks. Dyson will be drawn, and over the weekend on display will be paintings by Helen Cockburn, Geraldine Gustavino, Ruby Ellen and Dot Marshall. These wonderful artworks will be drawn at the close of the Exhibition on Sunday 28 October and winners will be notified. 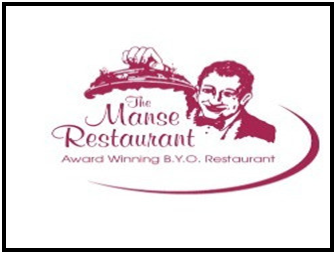 Catering - Final call to let Frankie Maher know what you plan to bring along phone 0419 946 716 so as we can organise extra catering if needed. To deliver plate of food on Friday evening enter into reception area and just before entry to main hall turn left up the ramp into kitchen where Frankie and Team will waiting. Please bring anything requiring heating on heating tray and we will transfer to serving plate. 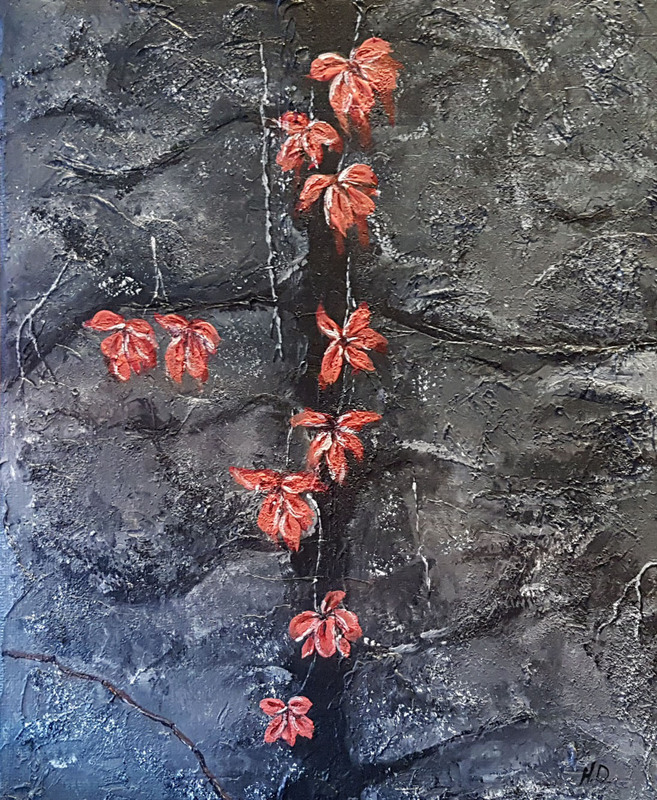 A resident in the Kimberley for a decade, I painted daily at the Red Rock Art Gallery in a cultural exchange studio environment sharing Kimberley Ochres (with my additions of gold and pearl Dust) with Indigenous artists. There is a certain feeling and attitude that evolves from living in a place that is considered isolated, wild, natural and untouched which makes you feel free spirited and gives me inner peace and a desire to express through my art. 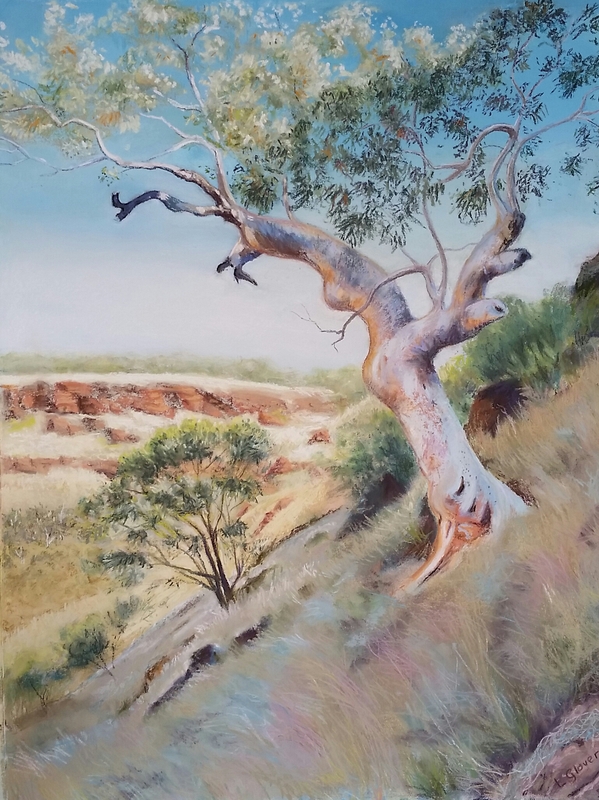 In my paintings I seek to portray and celebrate the uniqueness to the Australian North, the spatial isolation and texture of the landscape in a contemporary interpretation. 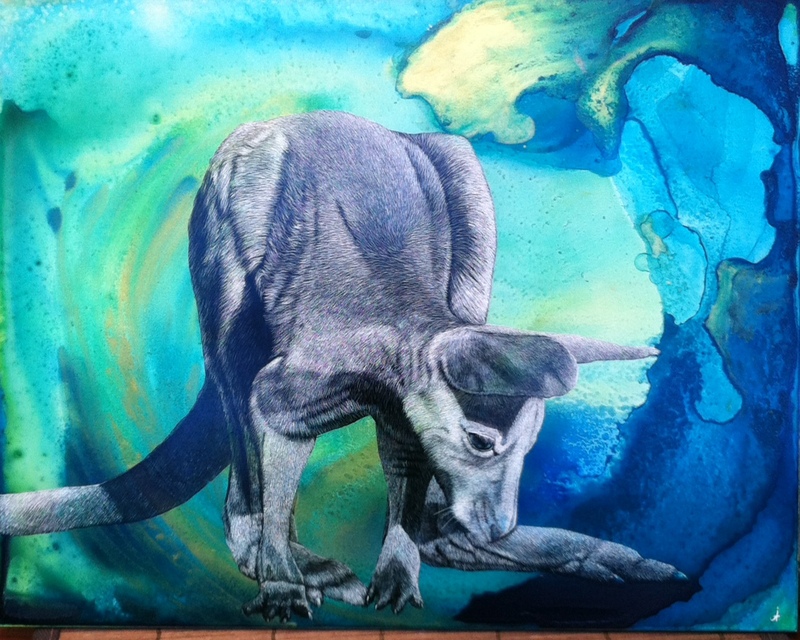 Jeannette is represented by Jahroc, Margaret River and the Studio Gallery Yallingup. 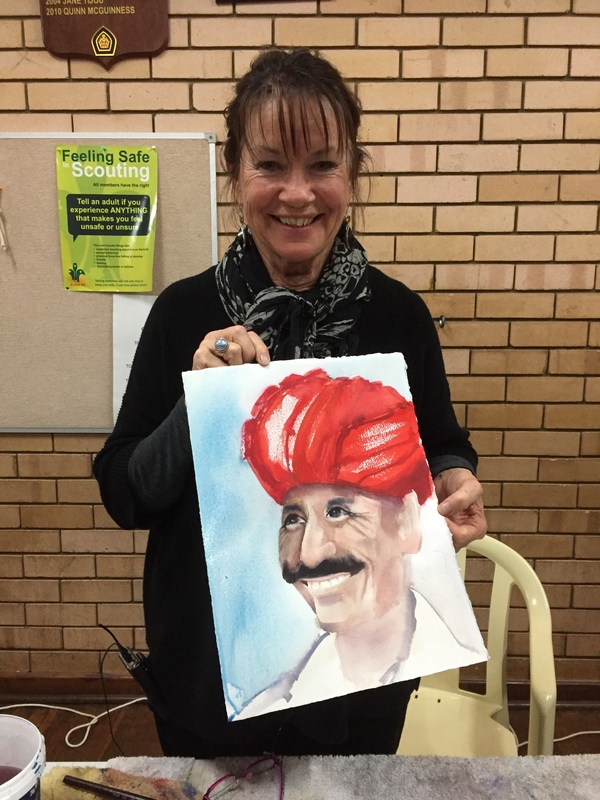 I have studied under and have been tutored by some of Australia's leading artists in watercolour, acrylics, inks and mixed media, which has kindled my interest and enthusiasm to achieve higher standards. I love watercolours, but also get great satisfaction from working with most other media. 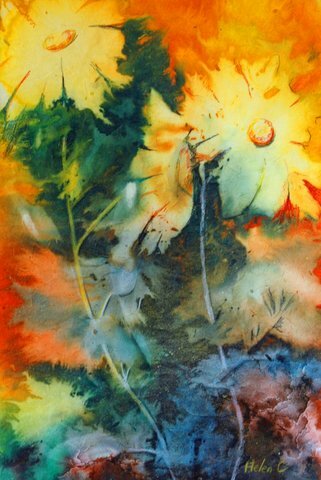 I paint various subjects with nature providing most of my inspiration and also enjoy developing my own techniques in abstract and semi abstract work. 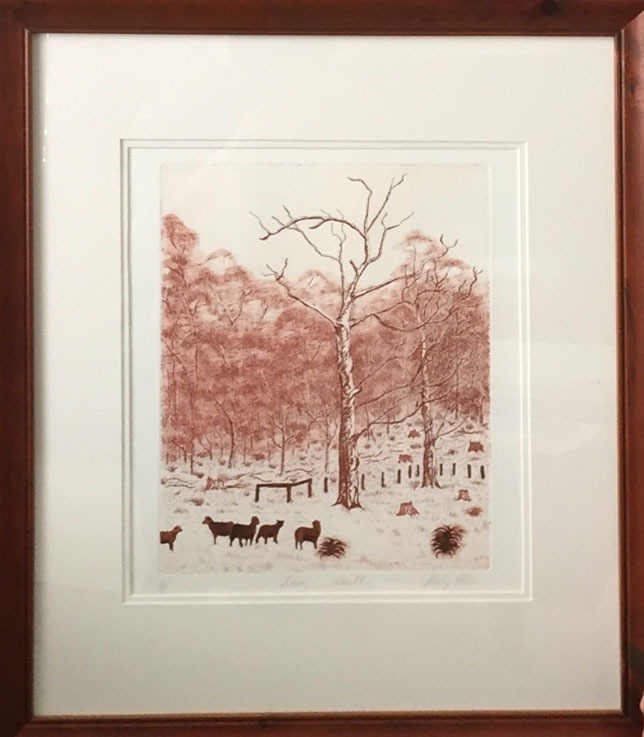 I am a founder and participating member (1987) of Armadale Society of Artists and a member of the Watercolour Society of WA. Art has always been a part of who I am. I studied at Canterbury Art School in England, where I completed my foundation course in art and design. Art was always at the back of my mind and years later I was very fortunate to meet a great group of likeminded people. I attended painting classes with them and soon we all formed a close friendship. 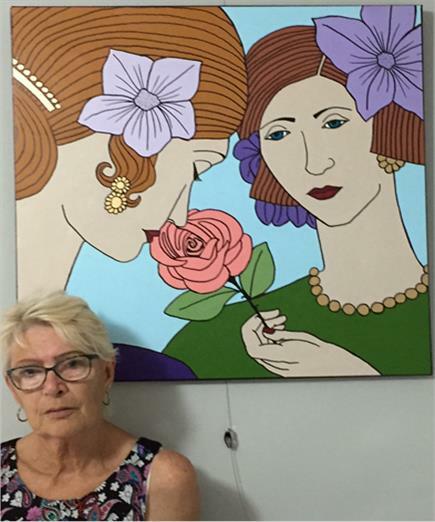 In November 2015, I exhibited at my 1st exhibition in Australia, held at Moving Art Studio in Fremantle. 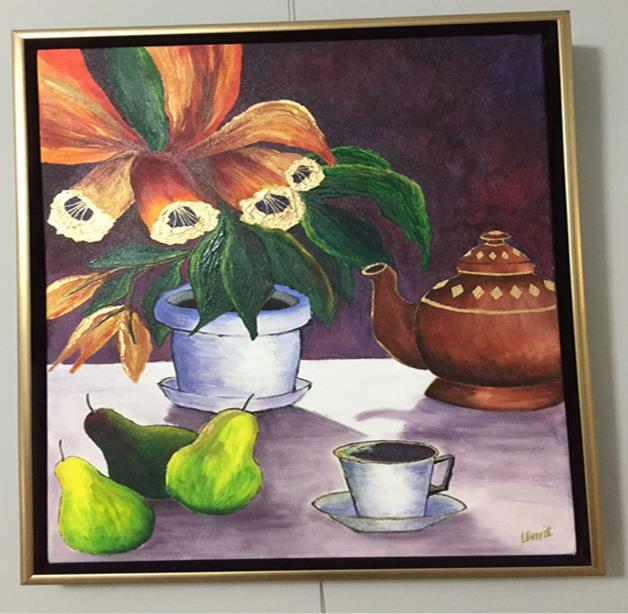 In Jan 2017, I had my solo exhibition, Colour Medley at The Agonis in Gosnells. I now teach at The Arthouse, which I love, sharing what I know and seeing students creating beautiful work and very importantly spending time to themselves. 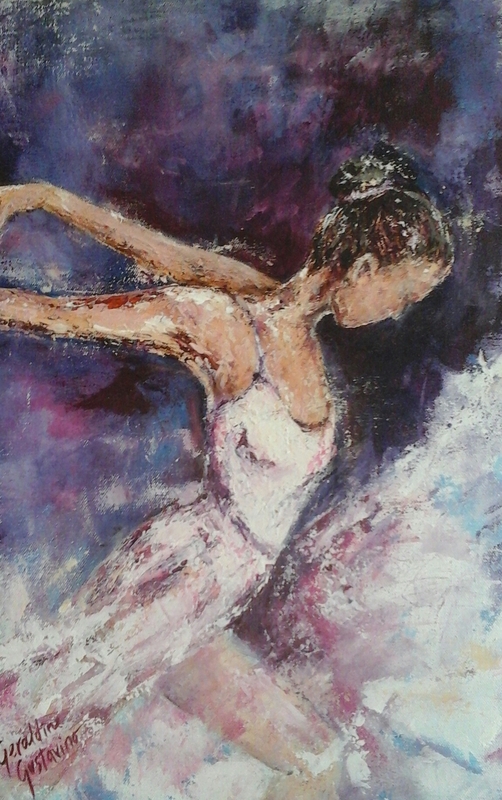 You can find more of my art on my Facebook Page -Geraldine Gustavino Art. My art interests have included painting, drawing, printmaking and more recently working with mixed media. 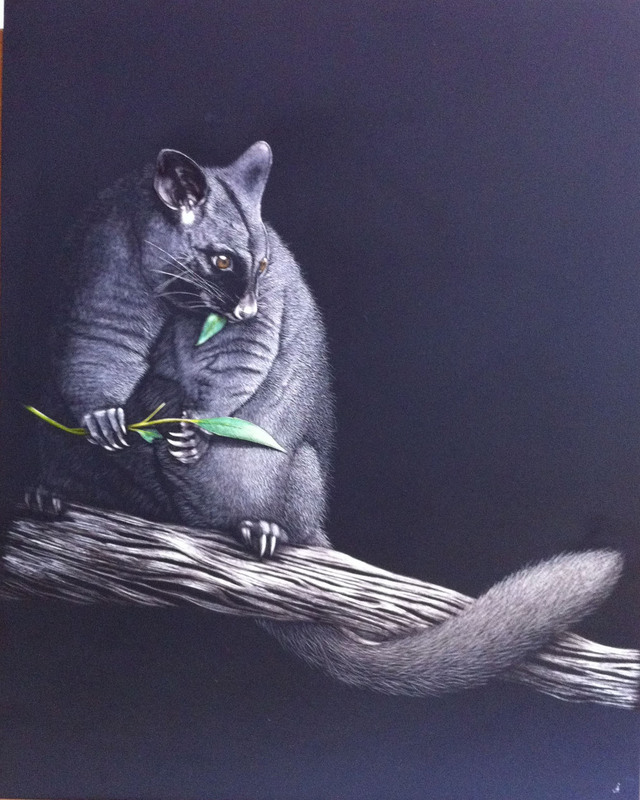 I have a Diploma in Printmaking and a Diploma in Art Studies and have attended many workshops and demonstrations to stay up to date with new techniques. 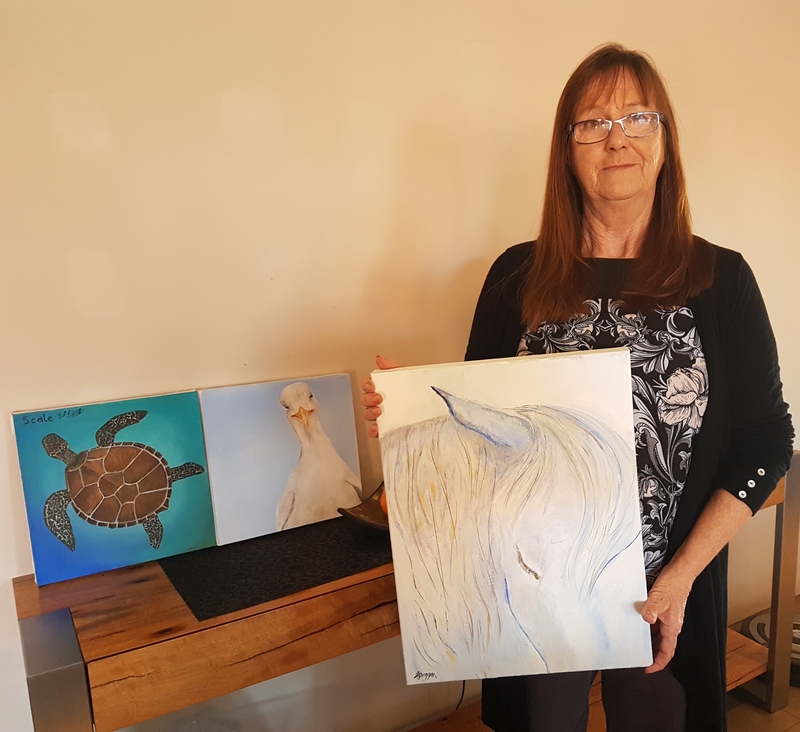 Dot has been on a voyage of discovery with her art since she started, a long long time ago, but since she joined this society about 20 years ago her voyage has been the most exciting part of her life. She has been an active member of the society holding the roles of treasurer, Vice President, president and stand in secretary. 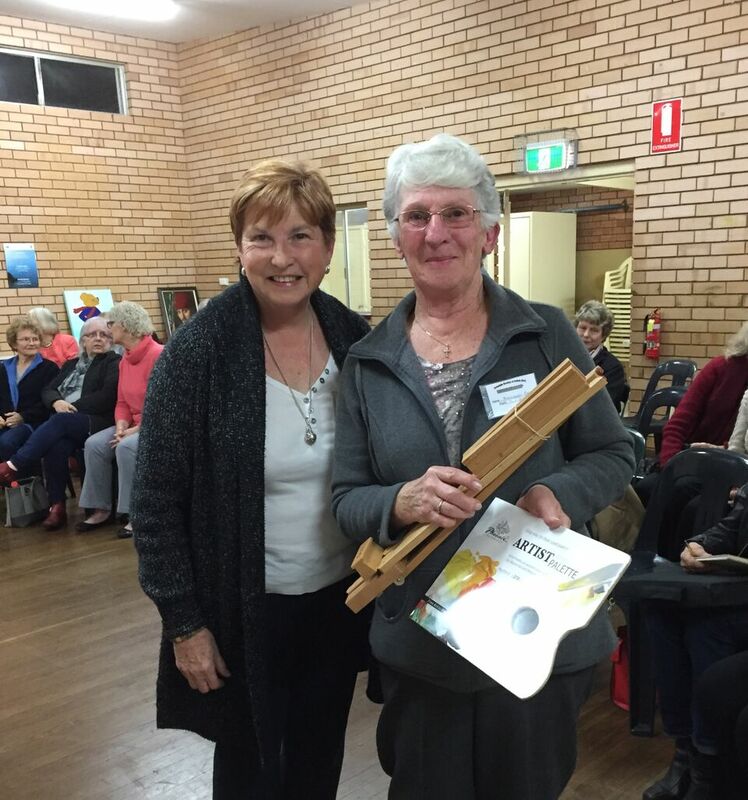 She also, with continuous help from other members established and ran the Art House in Kelmscott for 8 years. She will be forever grateful to this society that she is passionate about, thank you everyone. 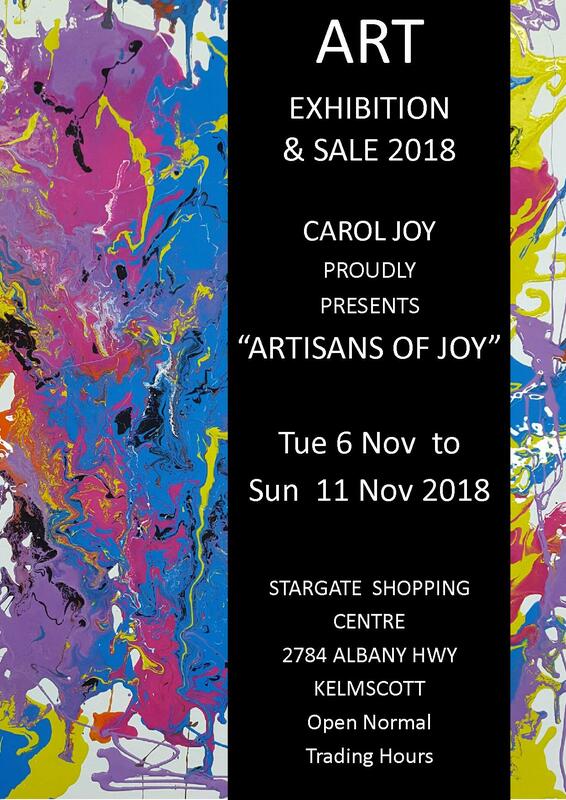 “ARTISANS OF JOY” is an exhibition and sale of work from Carol Joy’s remarkably talented group, they regularly appear at the Stargate Shopping Centre and now customers look forward with anticipation to their colourful displays. 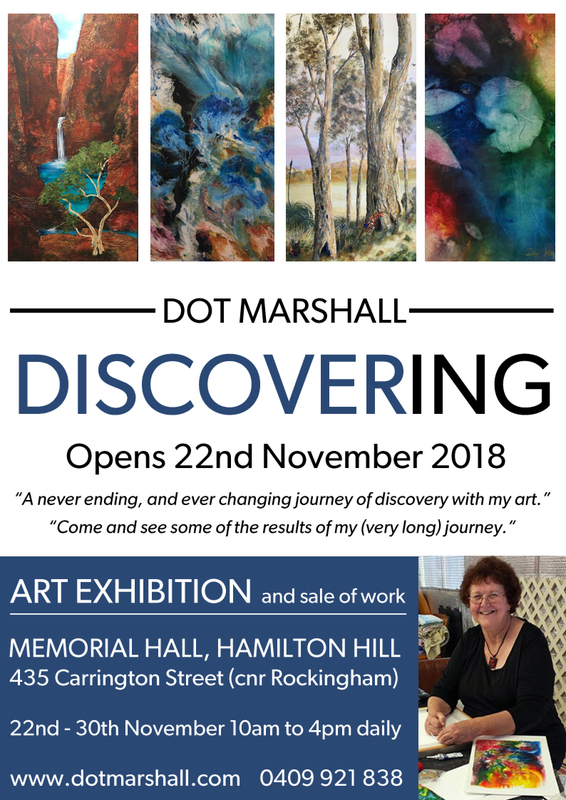 “DISCOVERING” the title of this solo exhibition by Dot was decided on after a brainstorming session around the kitchen table with her daughter and granddaughter. Dot wanted to show her exciting “journey of discovery” in her art career. Always experimenting with new ideas it is an ever evolving and ever changing path. She loves to pass on her “discoveries” to fellow artists. September has been a busy month starting with the Monthly Meeting. 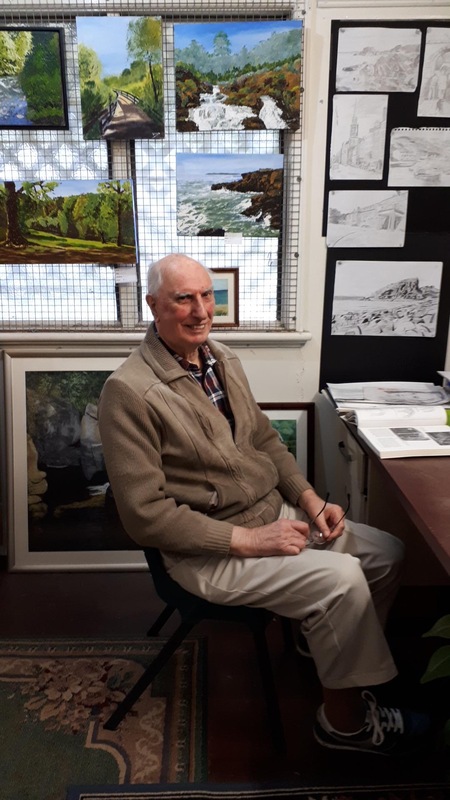 Our guest Demonstrator was Roger Reading, who showed us the versatility of painting in water soluble Oils presented in a witty repertoire of stories. 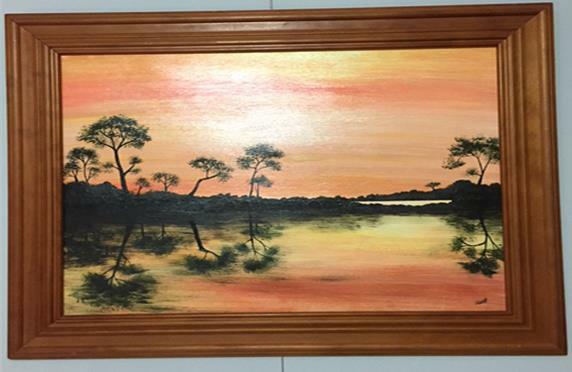 Roger chose our winner of this month’s challenge “Outback” Pat Watson who is featured inside this edition “What’s on my Easel”. We have to remind ourselves sometimes that we are volunteers running this Art Society. There is a lot of planning and personal time given up in organising our events by our Committee and Volunteers. 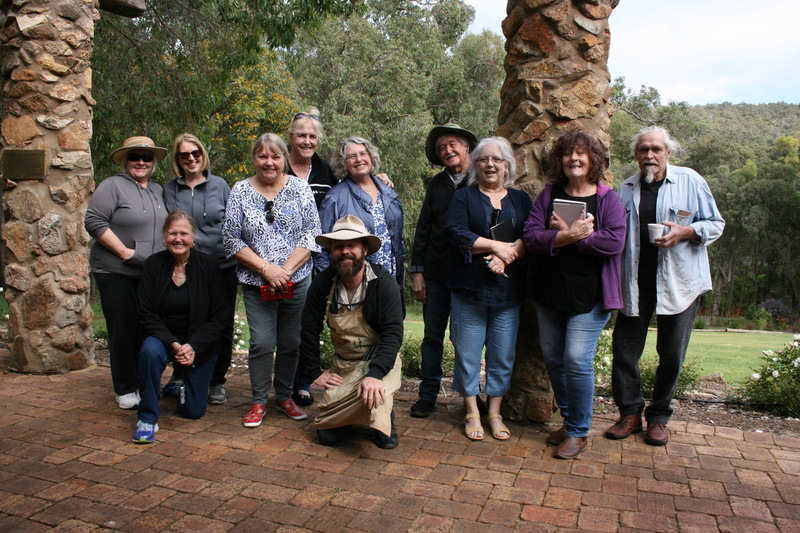 The Armadale Hills Open Studio Arts Trail and our Open Day were a great success and raised some funds for ASA and covered the costs of running these events. A big thank you to Val for co-ordinating these events and for giving up her personal time to ensure the smooth running. I would also like to thank our members and stall holders on Open Day for their behind the scenes contribution and helping out with the catering, setting up and cleaning up. You all did a fantastic job, I feel so grateful that we have such a wonderful group of people that belong to our Art Society. 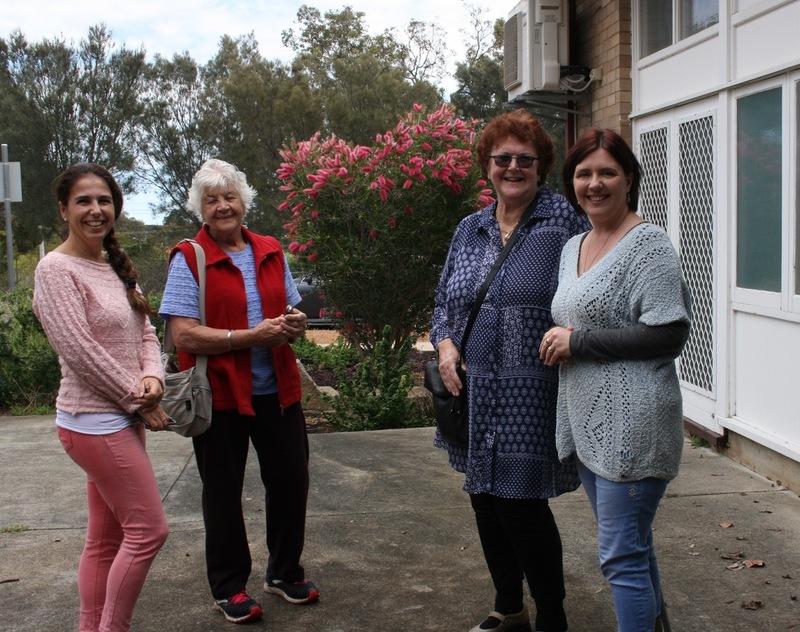 Thank you to our members who came along to support our Open Day and bringing visitors with you to support our stall holders, enjoying a Devonshire Tea, Sausage sizzle or buying a raffle ticket. 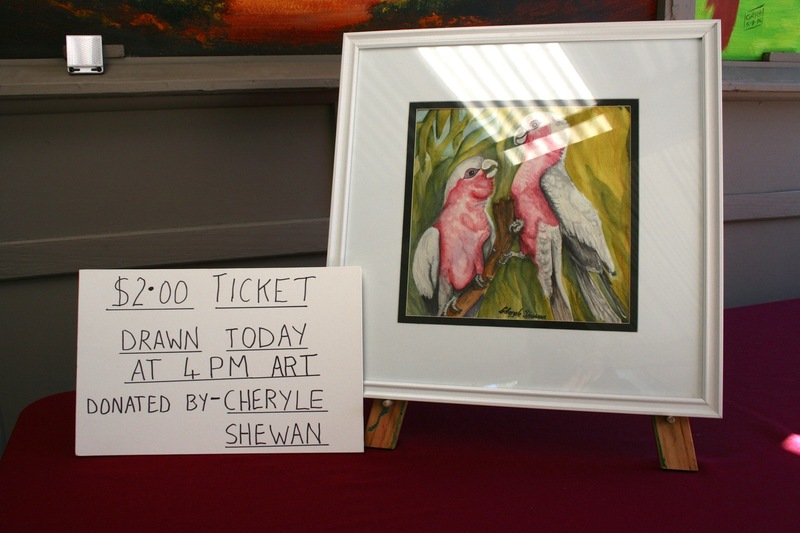 Thank you to Cheryle Shewan for donating her Galah painting and to Maureen Smith who looked after our raffles. The highlight of the day was listening to the wonderful voices of Jane and Kira singing Folk Music. We had lots of extra visitors, due to Jane’s Students from Roleystone Christian College performing and their parents and families who came along to join in the festivities. Our 2018 Annual Exhibition is coming up very soon over the weekend 26 to 28 October. By now hopefully our Members have thought about and submitted their entries for this years Exhibition as our closing date for entries is the 4 October which coincides with our Monthly Members Meeting on the 4 October. More information inside. 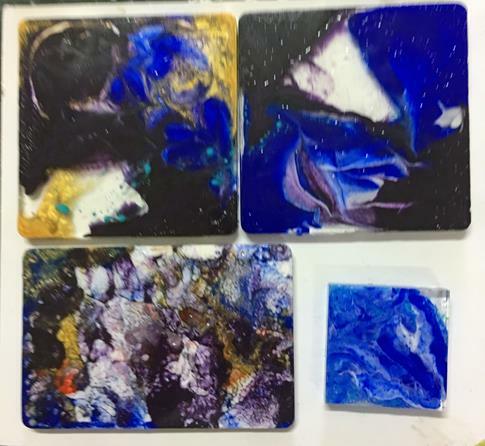 Sandy Schroeder from Art Basics and Art Scene will share with us her extensive knowledge of “all things acrylic.” From preparation, applications, and methods, including mixed media and image transfers, it will be a very informative night to bring out the best in your paintings. Friday 28th September that runs for a month. 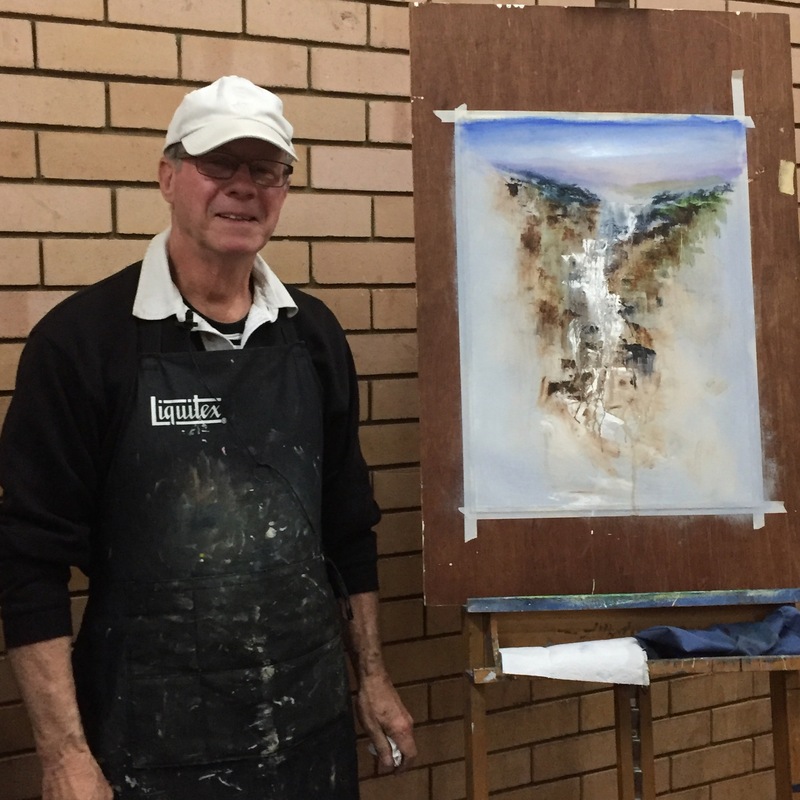 LAST MONTH’S DEMONSTRATOR WAS ROGER READING, Roger gave not only an entertaining demonstration of water based oils but entertained our members with his cheerful banter. Like so many other members of the art society I have been painting and drawing on and off since my early school days. When my children were very young I would leave my husband in charge and escape to tech college for two evenings a week to start my Fine Arts Diploma. After being home all day it was a great way to meet like minded people, keep my sanity and do something I loved. My husbands work took us to Eneabba for three years which at the time was a lovely little town with a great arts and crafts group. 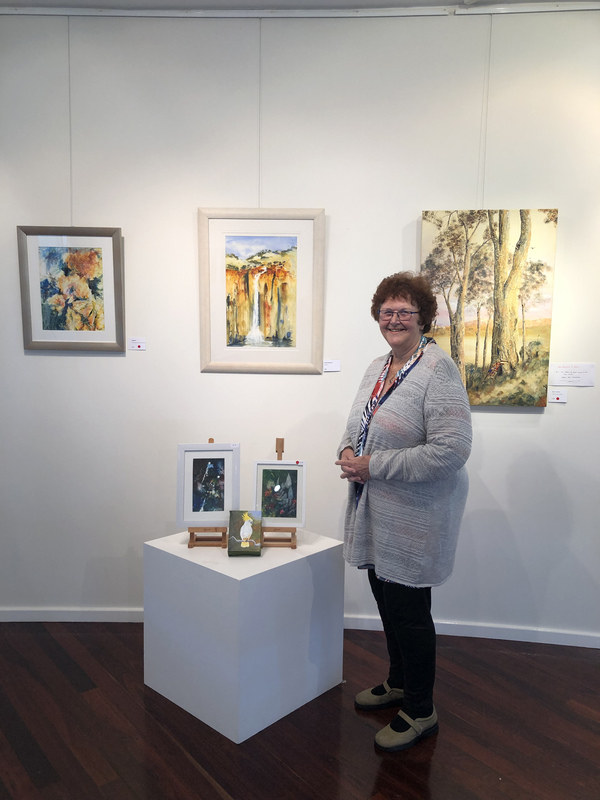 I enjoyed my time there, made lots of lifetime friends and was lucky enough to receive acquisition awards for two years running from the Carnamah shire’s art exhibitions. From Eneabba we moved to Dampier where I continued my Diploma at Karratha College. 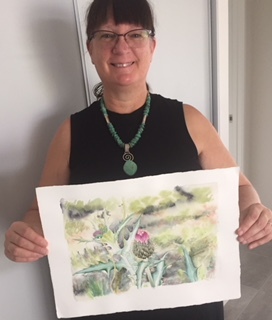 I enjoyed seven years of Pilbara painting joining the Art group, taking part in their exhibitions and doing lots of commission work. The Dampier landscape is inspiring with the colours of the spinifex, the desert pea flowers everywhere, the orange rock and the vibrant blue water, who could go wrong? Well what’s on my easel? there have been times when I have wondered what direction to take with my painting, I guess wanting to try something different but not finding anything that I felt really drawn to. My main subject has been landscapes although I also enjoy portraiture. For many years I used only oil paints but in the past few years I have also been using acrylics, my main reason for changing is the ability to travel with dry canvases and ease of clean up while doing our frequent camping trips. 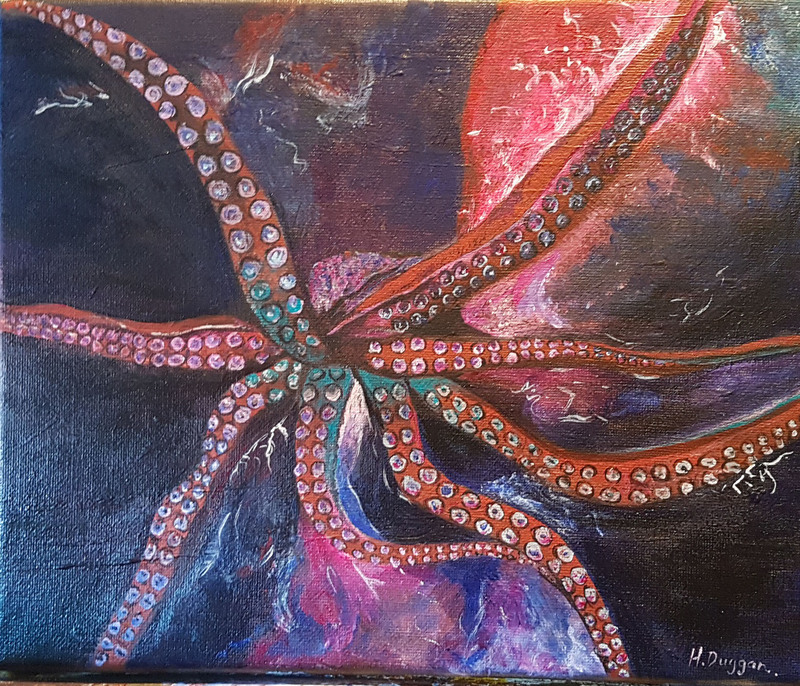 It has taken me a while to come to terms with getting the effects I want with acrylics and I am still learning as I try the different mediums that go with them. I think at times we all wonder what to paint next so it’s good to have a change and try something new especially when you feel a bit stale. What a great day, thank you once again to Val and all the many members who were hands on deck to help make this day such a success. 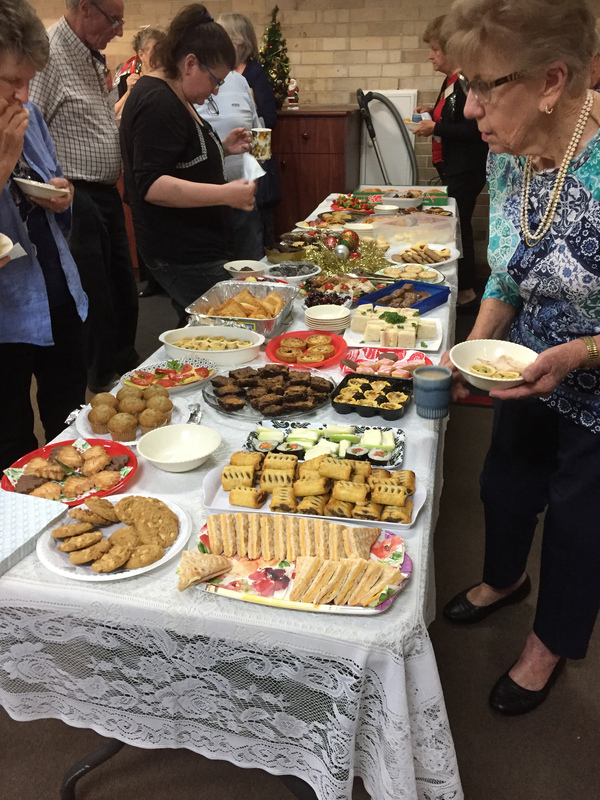 Our Sausage Sizzle and Devonshire teas were a hit and raised funds for ASA. 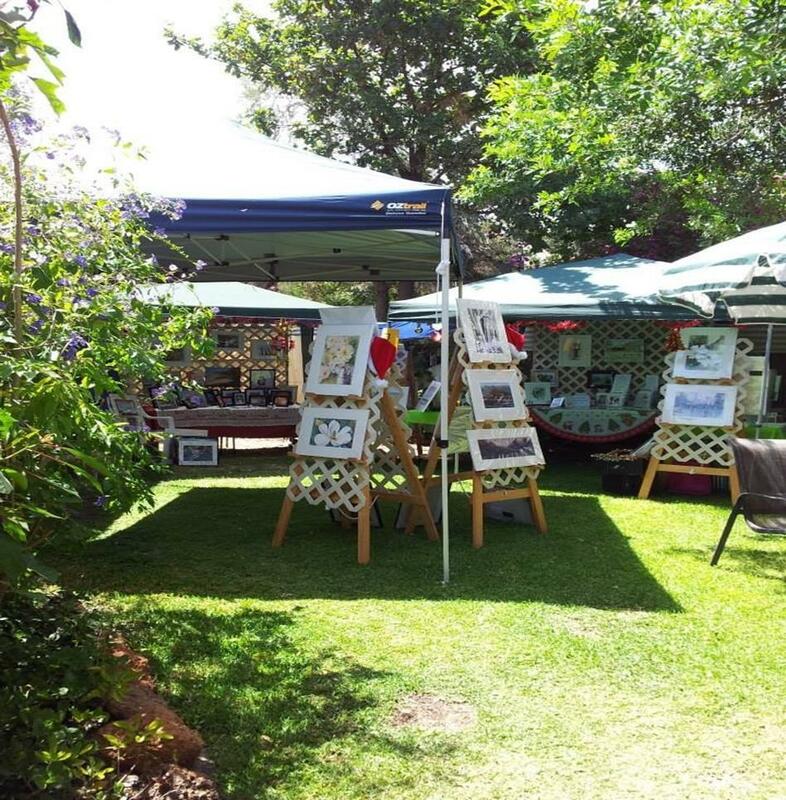 Thank you to our stall holders for participating and displaying their art and crafts. There were lots of smiling faces, sales were made but I think it was the atmosphere that put a smile on everyone’s faces. In the afternoon we had the beautiful sounds of Folk Music and singing with Jane and Kira. 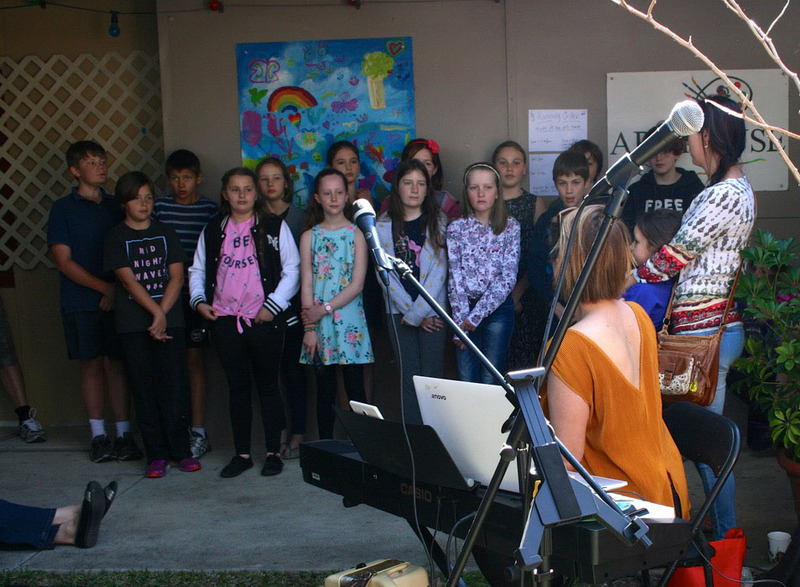 The Garden came alive when Jane’s students arrived on mass to entertain our visitors with several songs. 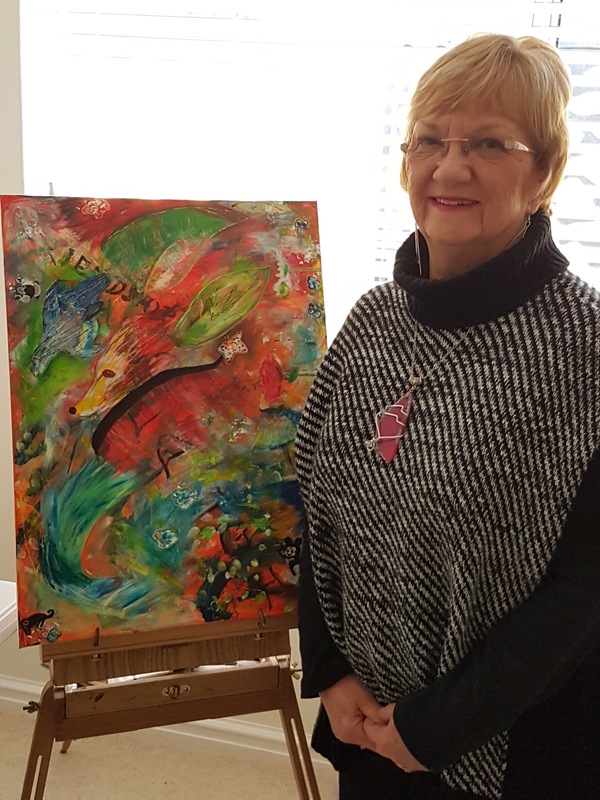 And a special thank you to Maureen who co-ordinated our raffles on the day also special thank you to Cheryle Shewan who donated a painting. 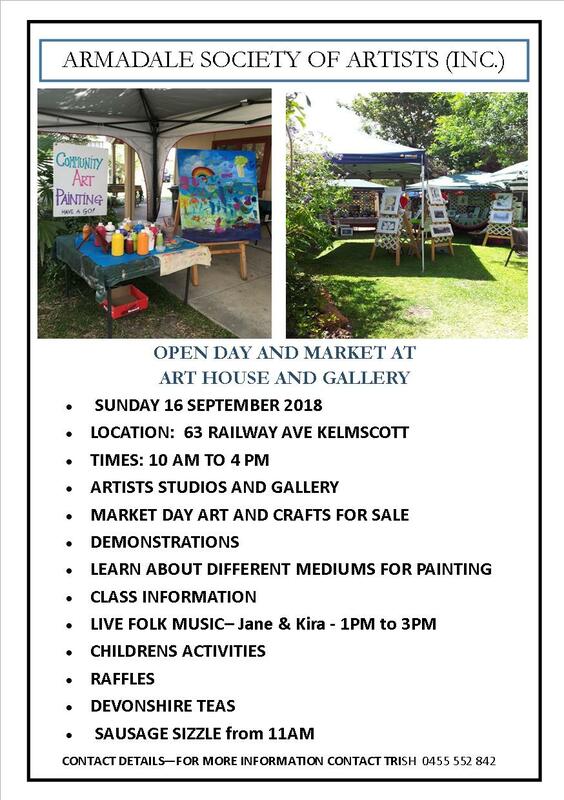 ASA have participated in the Open Studios Arts Trail for the past four years and we were one of 25 studios open to the Public over the first three weekends in September. 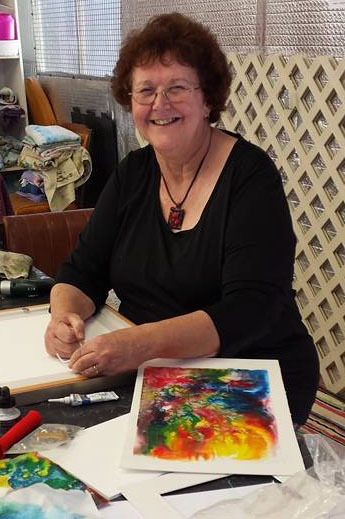 We would like to thank Val Mezger for Coordinating and setting up the Art House and Gallery for the AHOSAT. The Gallery really looked terrific with a display of 16 of our Members Artworks. 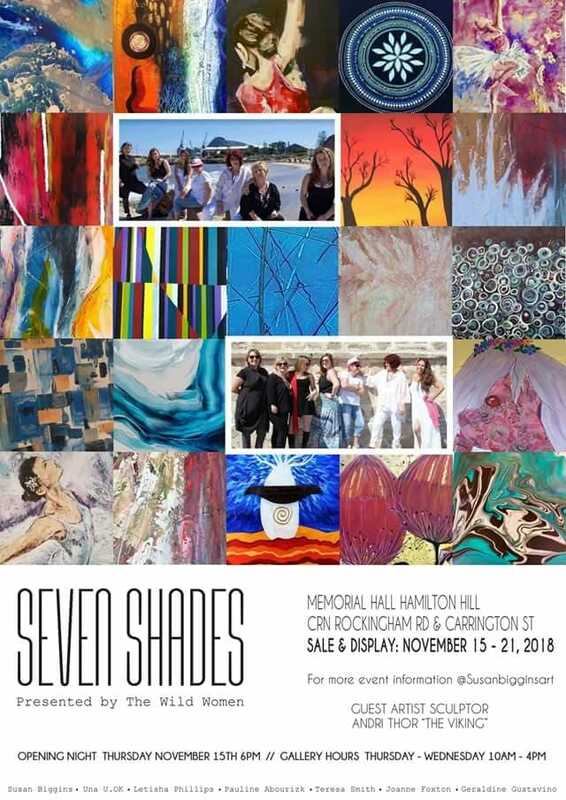 The Artists participating this year were Vicky Alchin, Margaret Barrie, Eddy Beer, David Box, Barbara Cotter, Jane Etienne, Geraldine Gustavino, Dot Marshall, Val Mezger, Diane Miles, Libby Morrah, Megan O’Brien, Sandra Reynolds, Geralyn Satur, Angela Saunderson, Maureen Smith, and Sandy Spindler. Over the three weekends these Artists set up their studios so that the public could view Artists at Work. 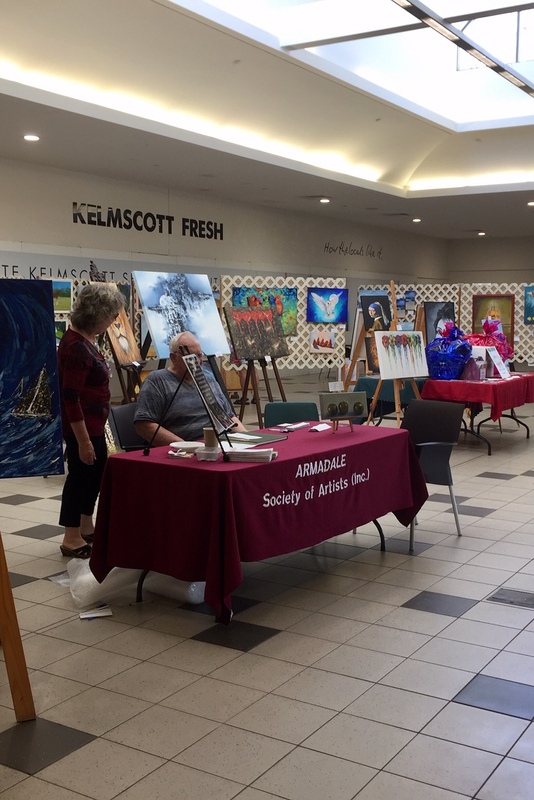 This was a great opportunity for ASA to showcase our Artists works and build awareness for ASA in promoting our Art Classes and our forthcoming Annual Art Exhibition in October. Thank you to Geraldine who looked after the Children’s Corner. We had lots of budding artists helping to create this years Masterpiece which will hang proudly in our new ASA premises. 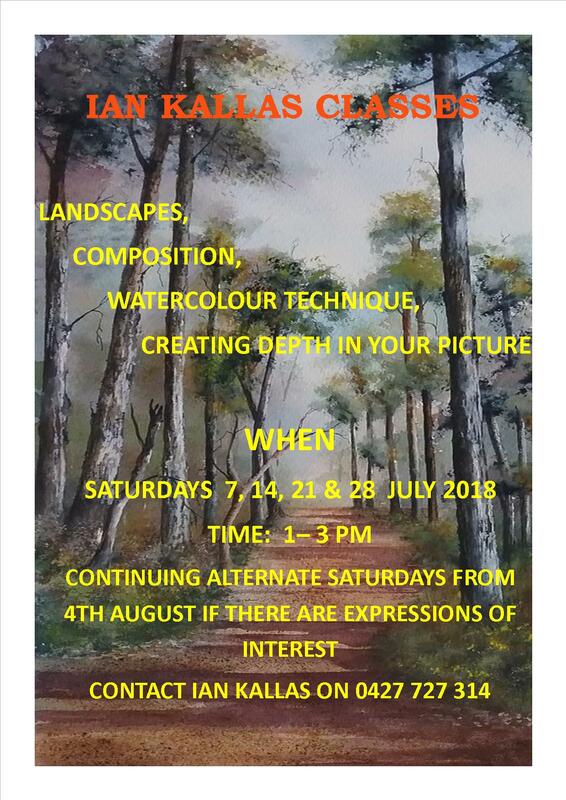 Studios for the first time over the thee weekends of the Arts Trail. 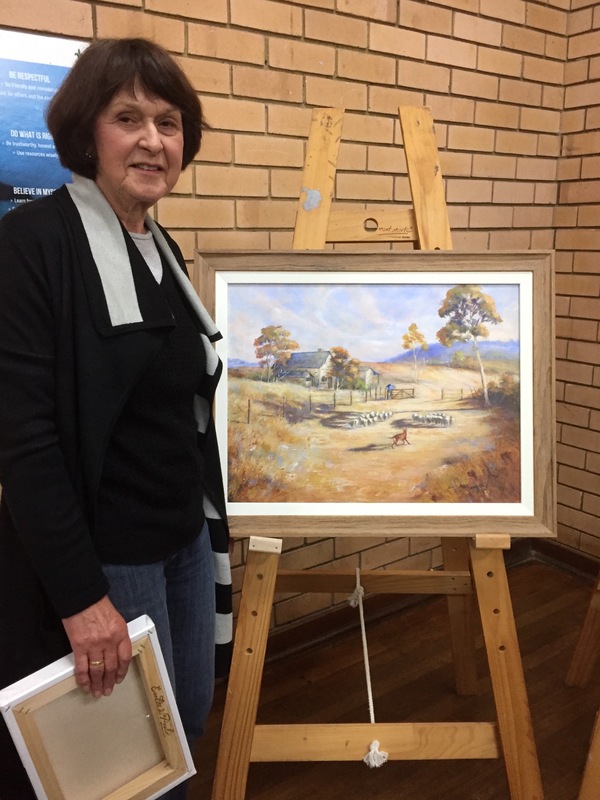 Lynda Everett located in Kelmscott, shared her studio with Ian Kallas and Linda Glover with over 65 paintings on display. Lynda’s Studio has been purpose built and most of the labour was done by herself. Gunter Lorenz - located in Bedfordale. Gunter’s paintings are surrealistic - symbolic paintings. He creates and produces series of works where the original topic of an idea can be artistically explored. Jenny Herbert - located in Mt Richon. 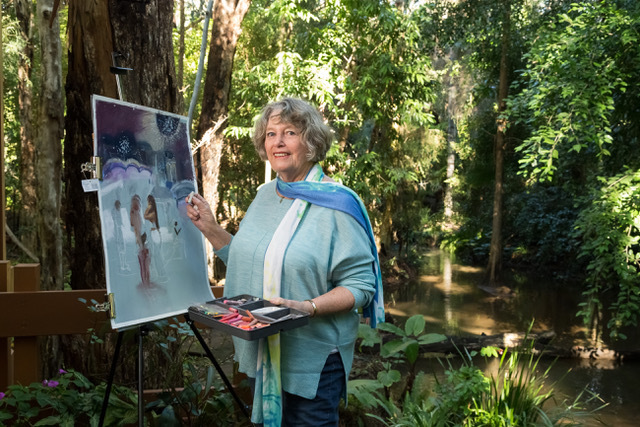 Jenny’s beautiful property is the backdrop to showcasing her wonderful artworks which are mainly Oils and Pastels. 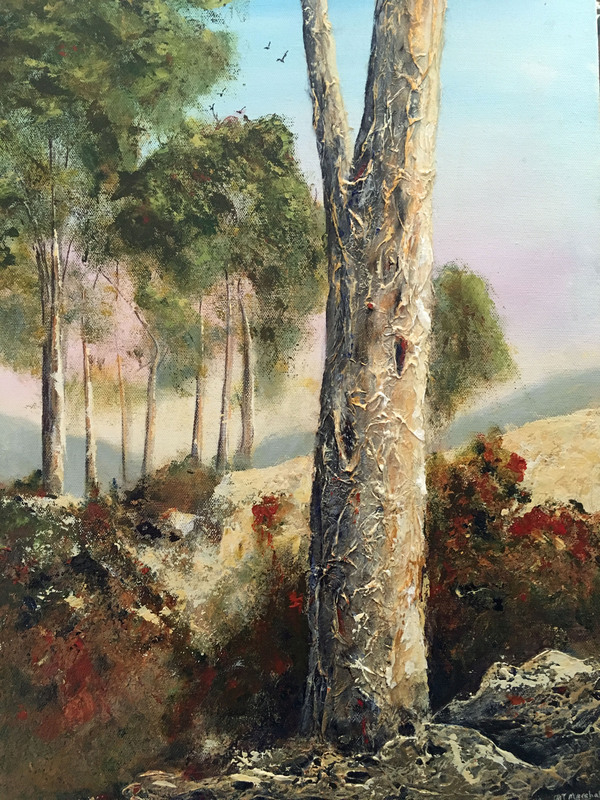 Jenny is inspired by the serene bushland and the sparkle of water in her local creek. 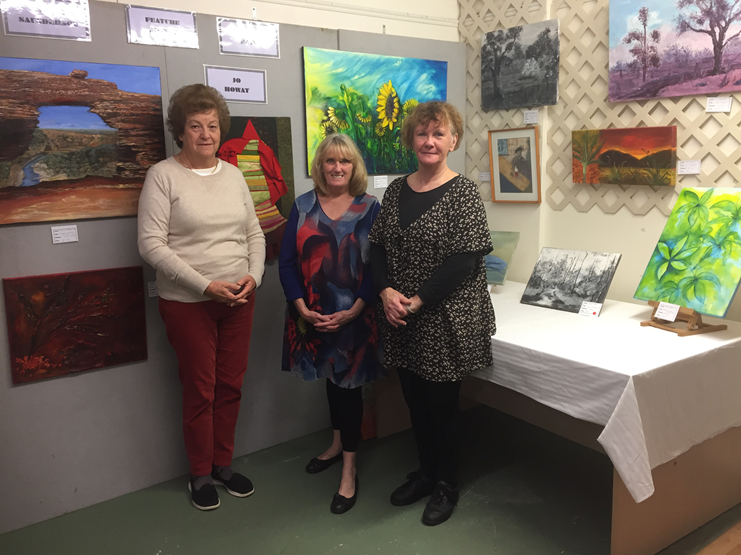 Our other members with Studios Open once again were Catherine Kelley, Trudi Pollard, Claudia Woeltjes, Geoff Reeves, Irene Young and Trish Halloran. 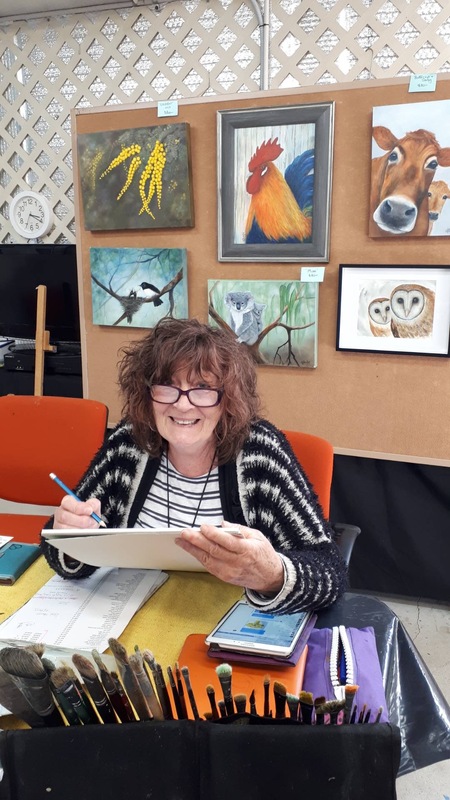 Recently I was granted an Artist in Residence opportunity at the Beverley Station Gallery and spent 2 weeks in the unique Stationmasters cottage offered by the Shire of Beverley. The venue as described to me by one of our members, Hazel Moore, who has been a previous Artist in Residence, sounded wonderful but I could never have imagined such a delightful place and I was overwhelmed by the amazing ambience and comfort available at no cost. The gardens were beautiful and a great place to have a glass of wine at the end of the day and the gallery is well set up with plenty of room to paint, entertain and hang your wonderful works. The Beverley Railway Station is no longer a stopping place for trains but the rail line is still in use and grain trains pass through often at irregular intervals including the middle of the night. It was a source of great joy to my guests (10 in all over the 2 weeks). We ran out like little kids to wave to the drivers and take photos. The Drivers got to know me so well that if my light was on (even at 2am) I would get a tiny little toot from the train thundering through which brought a smile to my face. 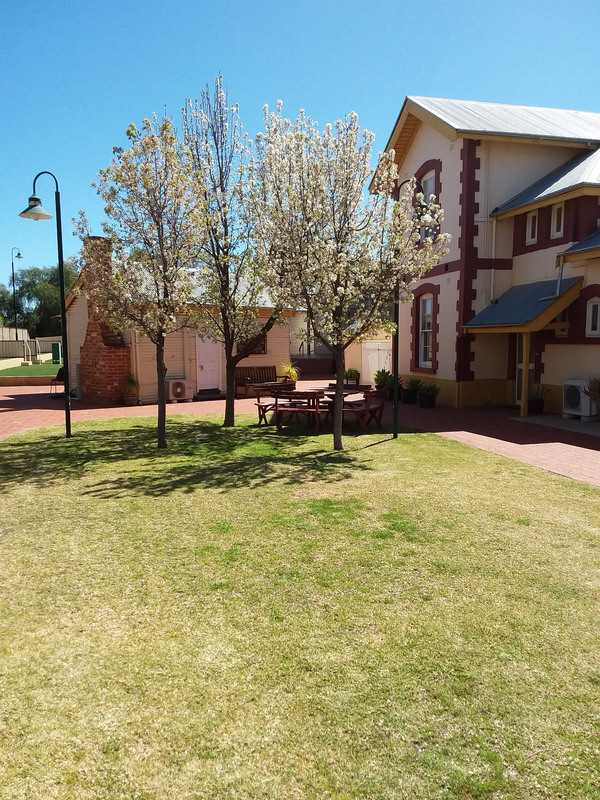 The Station and adjoined 2 storey cottage have been lovingly restored by a hard working committee and the backing of the Beverley Shire and are now heritage listed..................even the old outback dunny was saved from demolition - it has a definite lean and is lovingly tagged “the Leaning Loo of Beverley”. The town is quiet but friendly, the IGA store is right next to the gallery, the pub has good value meals and I certainly recommend the experience. Artist in Residence open the gallery Thursday to Sunday 11am to 3pm to the public and offer a workshop to the community. 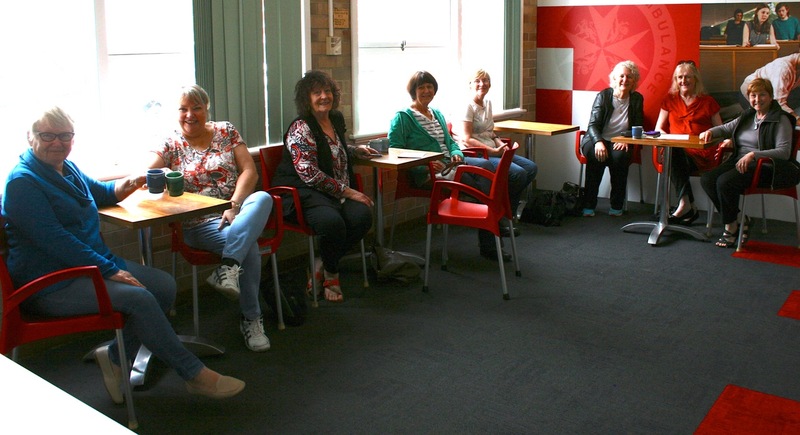 I offered a textile workshop both weeks and joined the patchwork group for a nice morning tea. I loved the interaction with the public and met some interesting people. Most visitors are interested in the historic building but some keen artists as well. I could say so much more and of course I have booked next year in October. I was made so welcome and nothing was too much trouble. If anyone feels they would like a few days in paradise there are 4 beds I can fill or please enquire if you would like to take a Residency – it is well worth it – a national treasure I reckon. 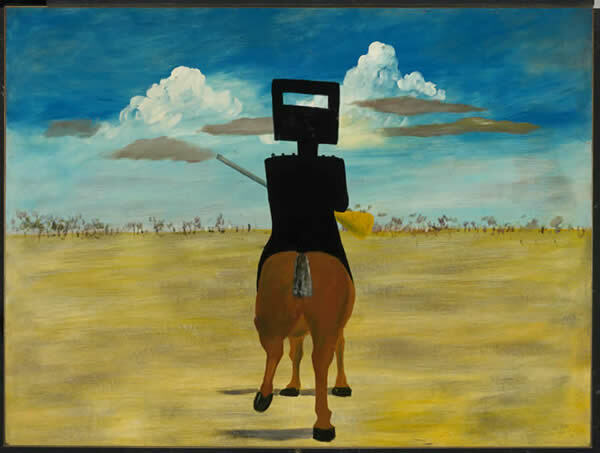 Fantastic exhibition of Sydney Noland’s Ned Kelly series. Lunch at the library, lovely organic food, good company, PERFECT. Weekend of 26 to 28 October 2018. This year’s Exhibition is fast approaching. Last day for entries is the next Monthly Meeting on 4 October. We have a lot of new Members this year, we would love to see you submit an entry, even if you can only enter one painting it is a great feeling to see your work displayed. 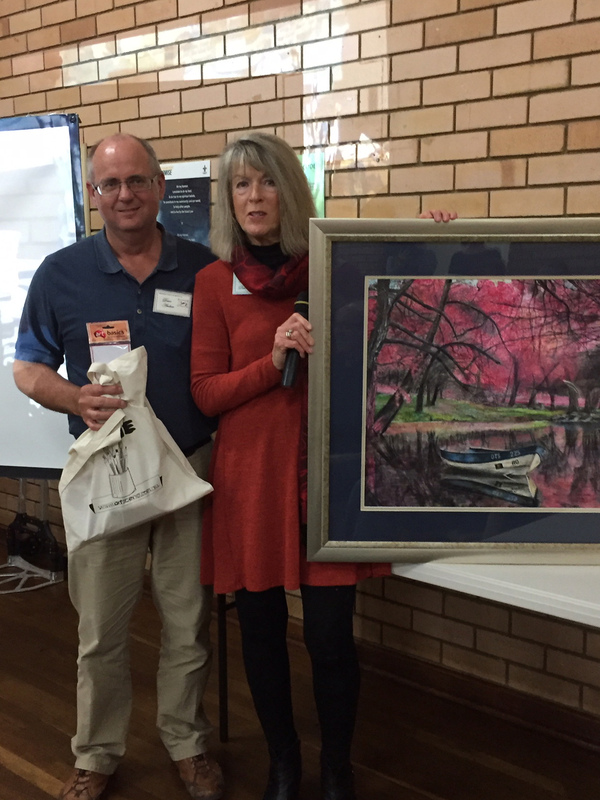 We are very appreciative to our Members who have donated a painting for this year’s raffles. Thank you to Jeanette Dyson, Geraldine Gustavino, Dot Marshall, Helen Cockburn and Ruby Ellen. 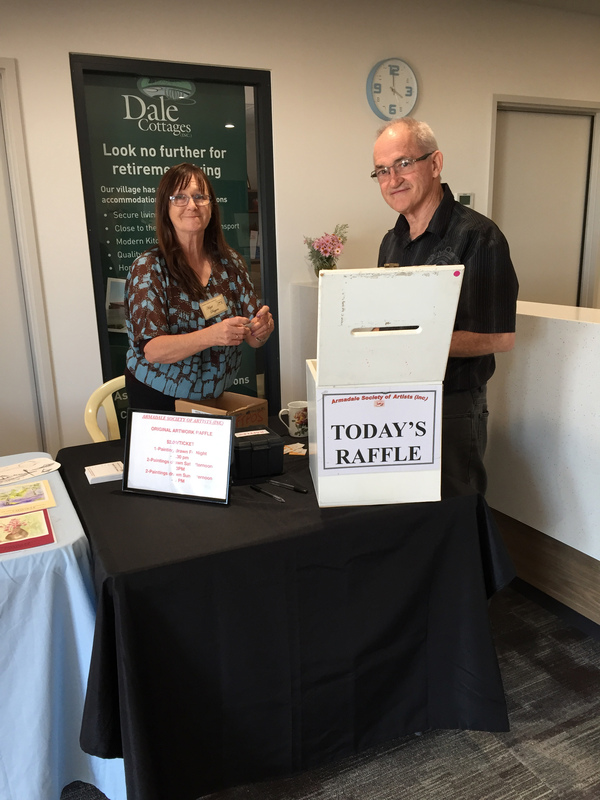 We will be drawing the raffles at close of Exhibition except for Jeanette’s which will be raffled on Opening Night. 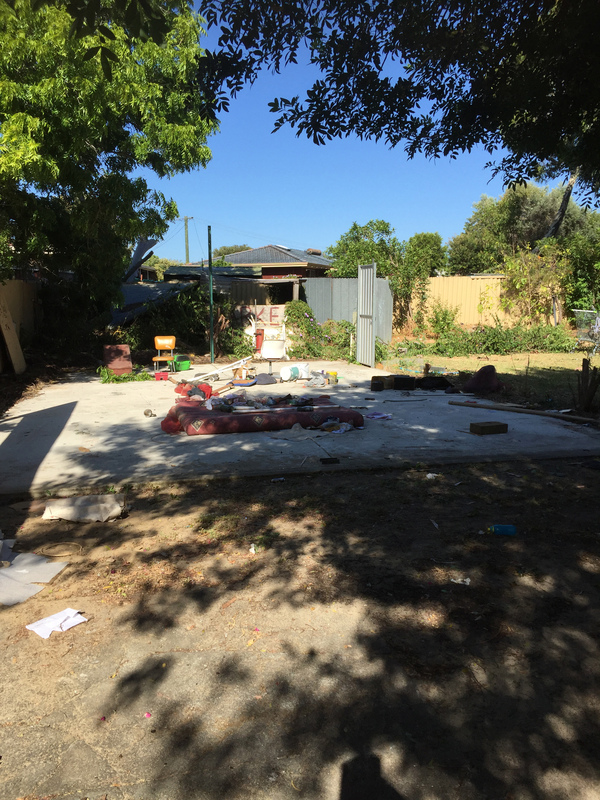 An update on our Grant application, City of Armadale have advised us there is a delay on the September decision for all the Community Grants we will now be advised by 19 October which is a week out from our Exhibition. So, keep your fingers extra crossed. For cost saving reasons we are asking our Members to please supply a plate of food for our Opening Night. We require a mix of savory and sweet cocktail party finger food. Food that’s easy to hold a drink in one hand a tasty bite in the other plus a program of course. 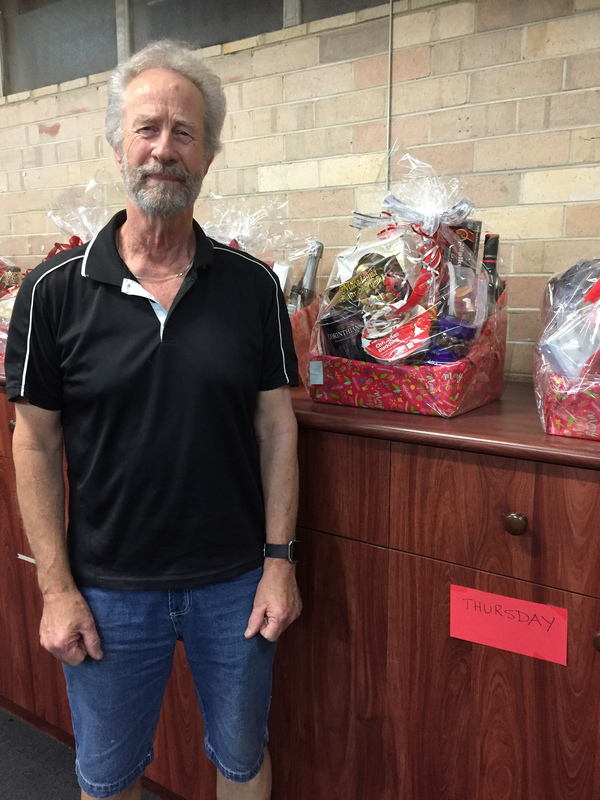 If you can help out please advise Frankie Maher who will be coordinating the catering, email: [email protected] or phone: 0419 946 716 and advise if you will be bringing savory or sweet. Sunday 21 October collating the programs. If you can spare some time, please advise Maureen on 0416 257 594. Word of mouth is still the best means of advertising our Event, please help by dropping flyers off in your local areas. This year invitations will be sent via paperless post and mobile phone message. We will still post to members who receive Newsletter by Mail. Exhibition, particularly the use of sticky tape on canvas not being secure. 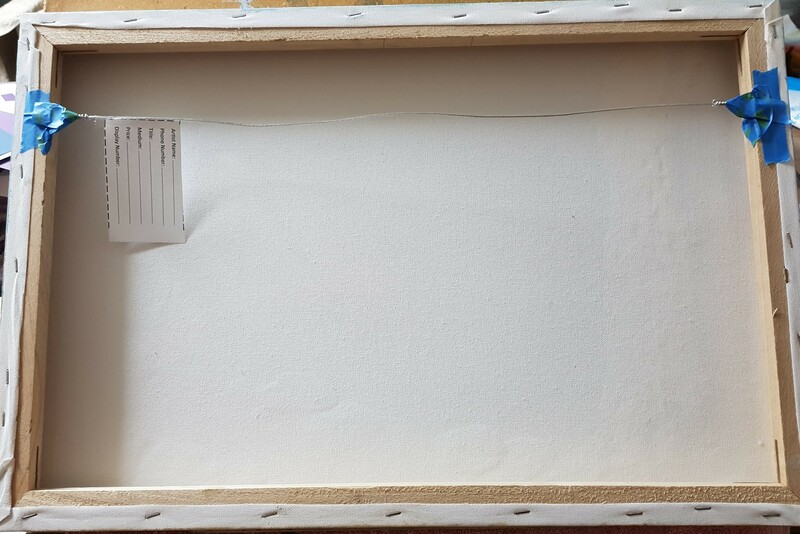 It has been suggested that the easiest and most effective way to attach the label to the back of a painting is to use cellophane tape on one edge of the label and place the other half of tape over the hanging string. Spring is just around the corner. With all the recent rain I am sure our gardens are starting to go crazy and soon we will be alive with the colour of Spring Flowers. 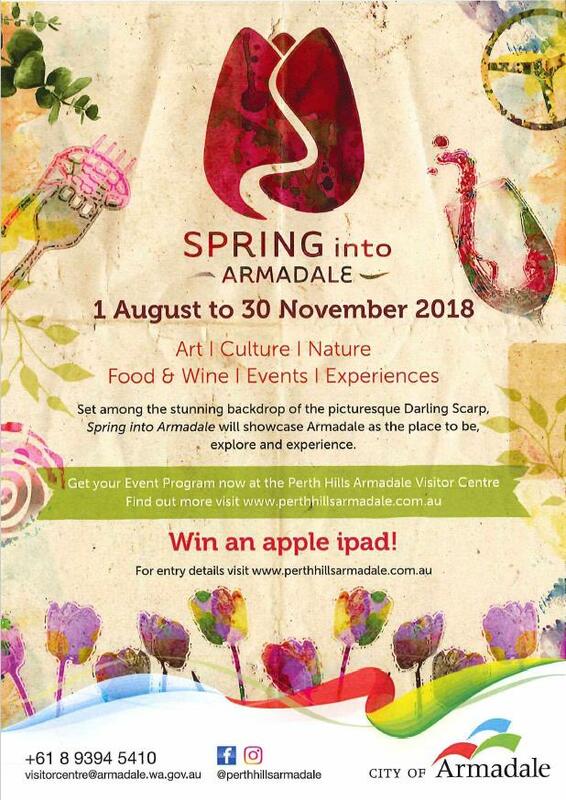 The “Spring into Armadale” Event Program is now available with all our Armadale Region happenings. Please see flyer. Once again ASA are preparing for it’s fourth year with the AHOSAT. The Art House will be displaying and demonstrating to the Public. In the middle of all this we are holding an Open Day and Art & Craft Market on the 16 Sept. This year it’s worth mentioning that we have quite a few ASA Members opening their studios for the first time. 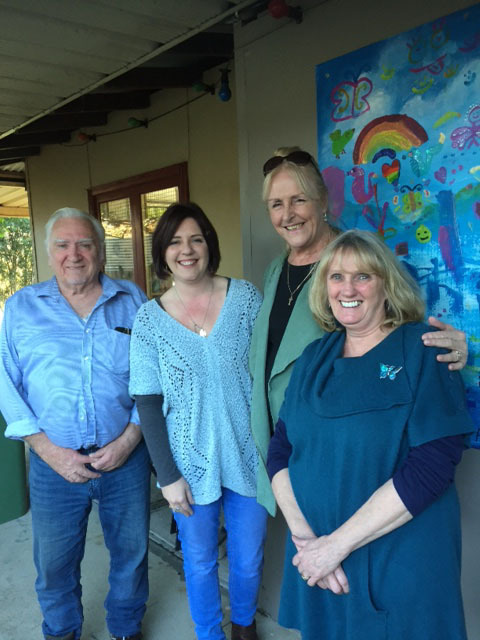 Jenny Herbert, Lynda Everitt with Ian Kallas and Linda Glover, Gunter Lorenz. We wish them all the best. The Pop-Up-Shop closed on Monday 20 August after 10 months operating. It felt quite sad that our time has come to an end for now. What a wonderful opportunity this has been for our Members. 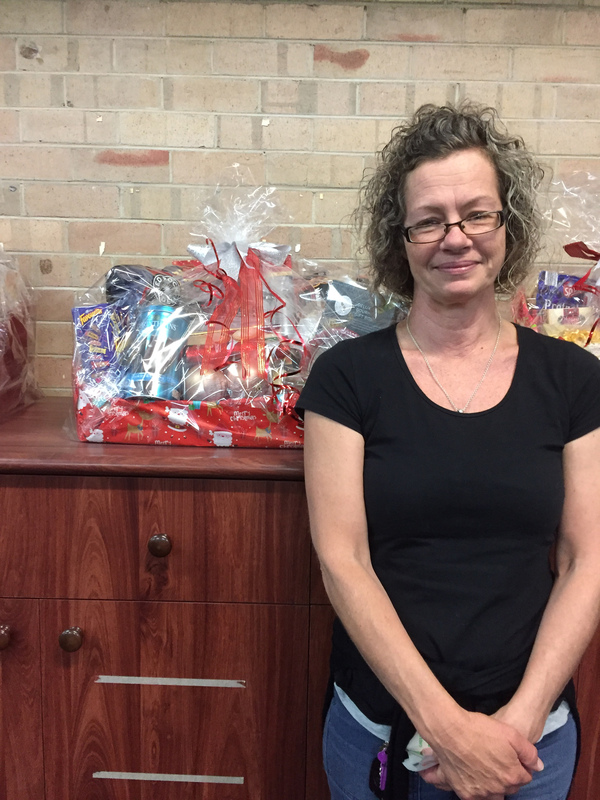 We thank the Armadale Shopping City in particular our lovely Siobhan from Centre Managment. The door has been left open for ASA to return if the opportunity arises again and definitely Exhibitions in the Open Space are back on the agenda. 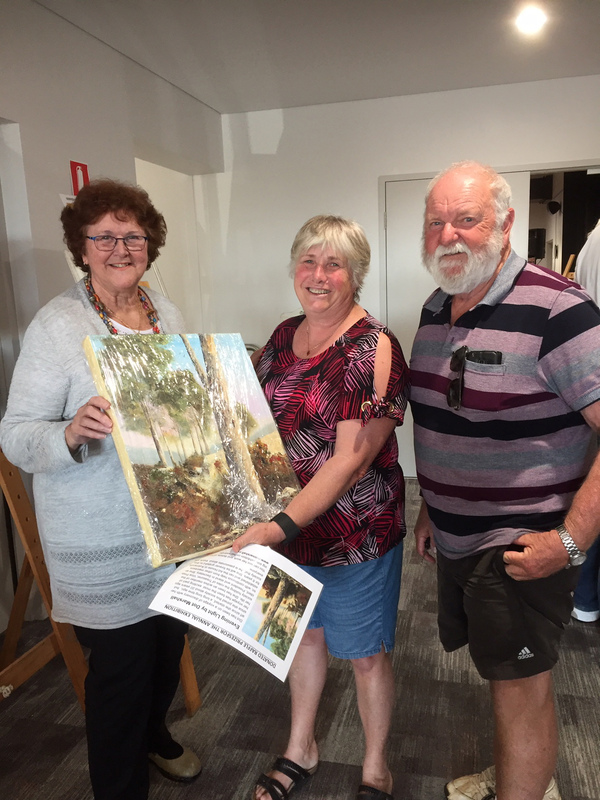 Outside of the Frame concluded, which was held at the new Rossiter Pavilion Piara Waters. What a beautiful building! Thank you to our Members who travelled that little further to do a roster. I think we were of the opinion that the Year12 students Art on display was of a very high standard. Congratulations to all the students and schools on a job well done. 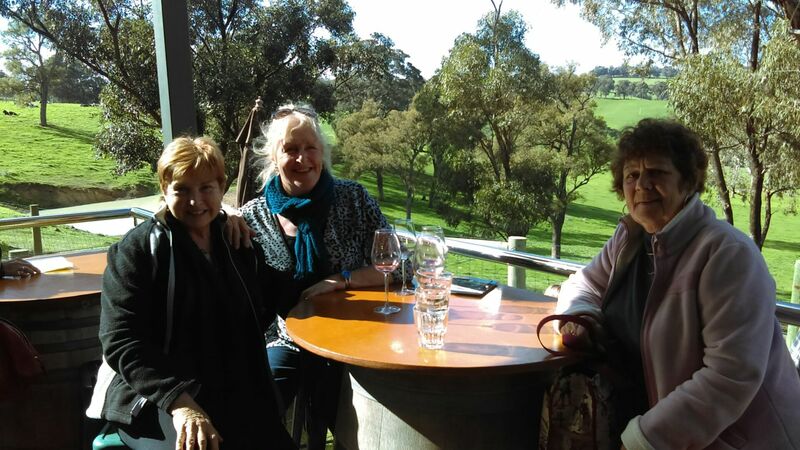 Well done to our Feature Artists for August Diane Miles, Wendy Bishop and Barbara Cotter who held an afternoon informal drink and Nibbles at the Art House. There was around 45 members, friends and family to help them celebrate and the food was delicious. 30 September from10am at the Art House Catalogue covers. 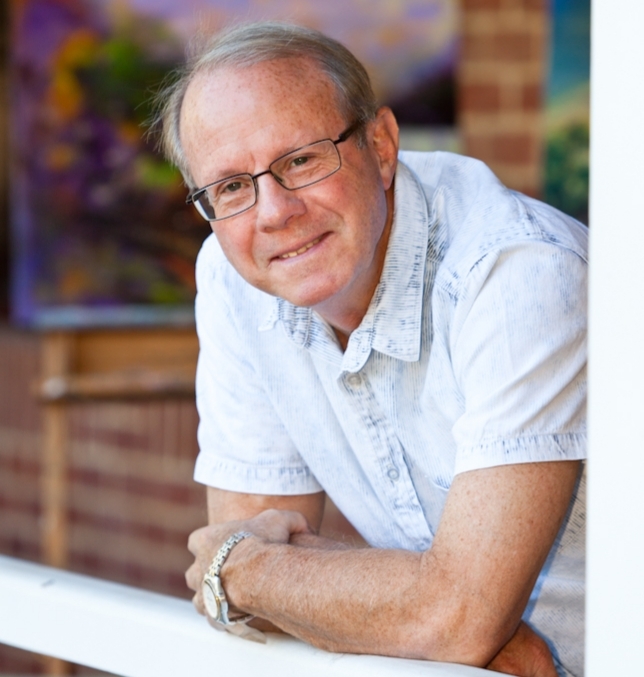 This month's demonstrator, Roger Reading, Roger is an oil painter whose world travels inspire his art. He paints from his bank of feelings and cultural appreciation. To him, "art is about having fun and enjoying the journey." This month the Pop-Up-Shop News is coming from Trish Halloran as Sandie is away on a well deserved holiday. It is sad to say goodbye for now to our ASA Pop-Up-Shop. We started the shop last November and our final day was Sunday 19 August. We have traded for the past 238 days and in that time we have sold over 300 paintings and have recorded over 11,000 visitors to the shop. That is an amazing effort! To our shop participants past and present a big thank you for all your diligence in handling the two rosters per month and congratulations on selling your artworks over this period. ‘The feedback from our shop participants was that the social interaction between the visitors was such a positive experience. Through that interaction we have gained over 30 new Members. I would like to say thank you Sandie, Shop Coordinator on behalf of all our shop participants and myself. Sandie has worked tirelessly in handling all the details of running the roster and the shop. Thank you also to our hard working Sub Committee’s Maureen, Val, Mary and Jim for sharing the work load and for all the extra rosters they did to help out. 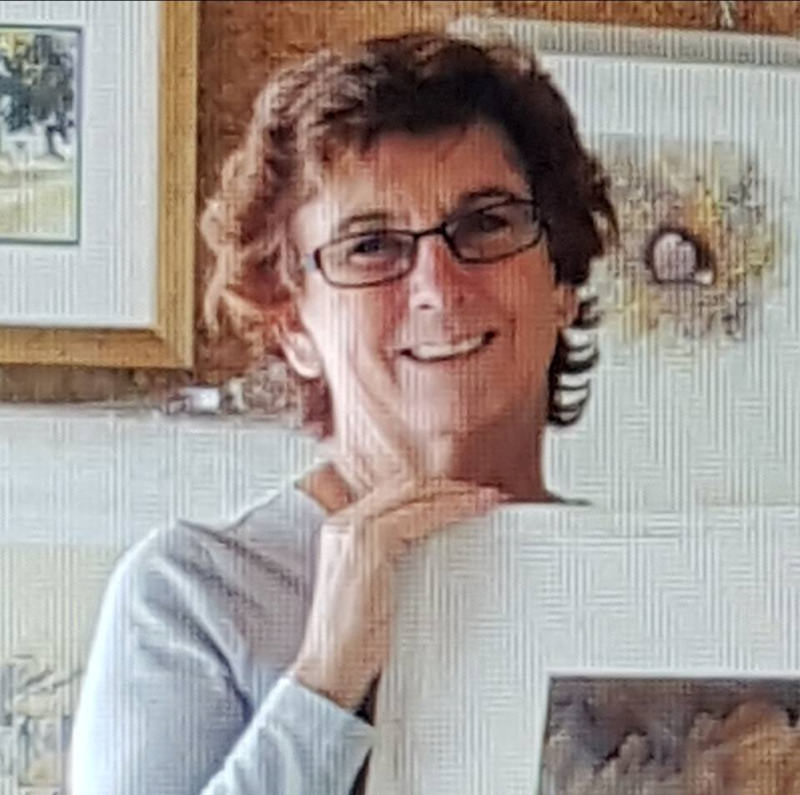 We cannot forget a thank you to Vicky Alchin our Treasurer for making sure that all our Artists were paid promptly and efficiently on the sales of their paintings. Finally a big thank you to Armadale Shopping City Management and Siobhan, for giving the ASA such a wonderful opportunity. We are leaving the shop with the knowledge that we may be back at some stage with another shop, but in the meantime it’s great news that we can still hold our Exhibitions in the Open Space of the Mall. We will certainly keep you posted. Last week LINDA GLOVER won The Curator's Choice for "Island Boy" and Highly Commended for "The Guardian" at the MCAA Awards 2018 at Atwell Gallery, Congratulation Linda, these are truly beautiful. Well deserved. 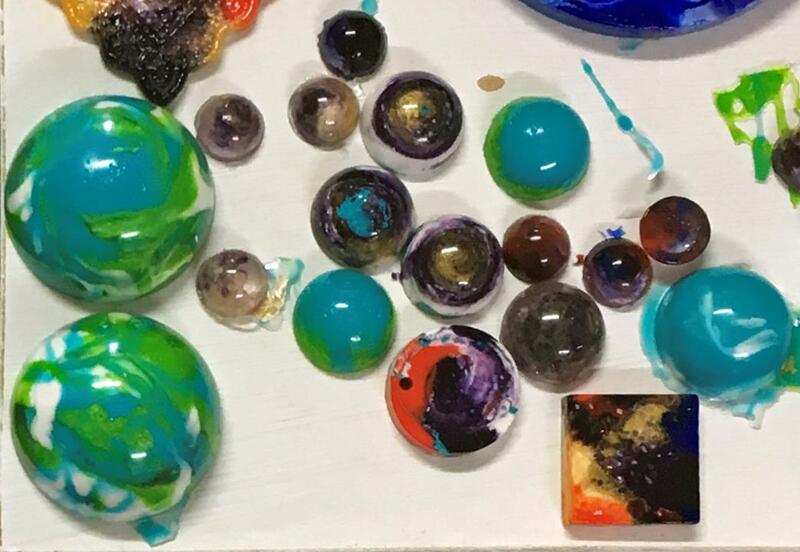 There is no feature artist at the art house for the month of September as the Open Studio Arts Trail will be running for 3 weekends over the month. The Art House will be open as normal and the regular classes during the week (except Friday) will be held as usual. 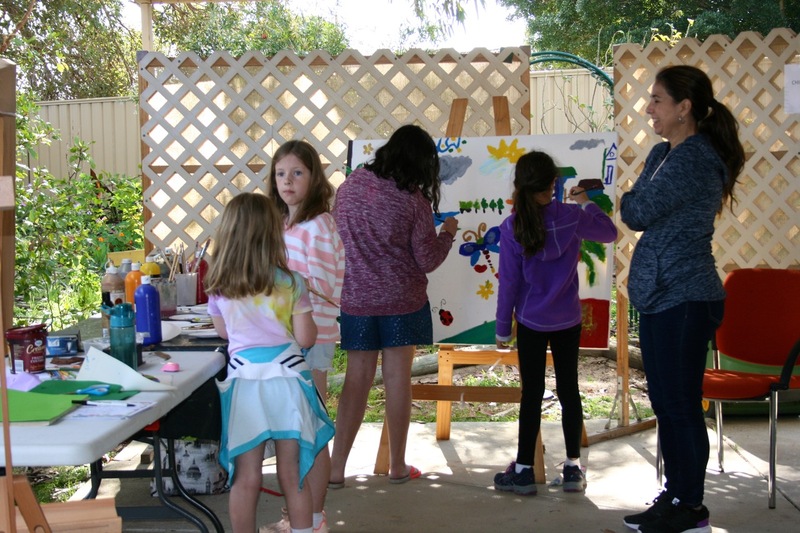 The art trail is held on Friday, Saturday and Sunday. 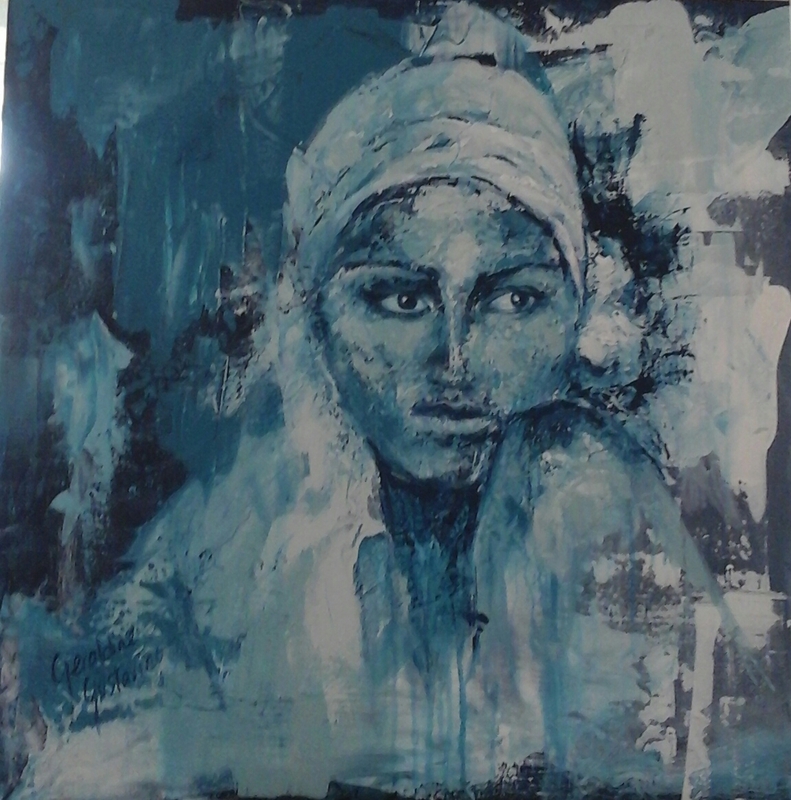 AHOSAT PARTICIPANTS TO BRING PAINTINGS TO ART HOUSE 31ST AUGUST. Once again Eddie Beer’s ever popular workshop at the art house was a great success, some lovely paintings here well done everyone. The Open Day will also include a market day. If any members would be interested in booking a market stall single or shared, you will find event sheet in the shed to write your names down. 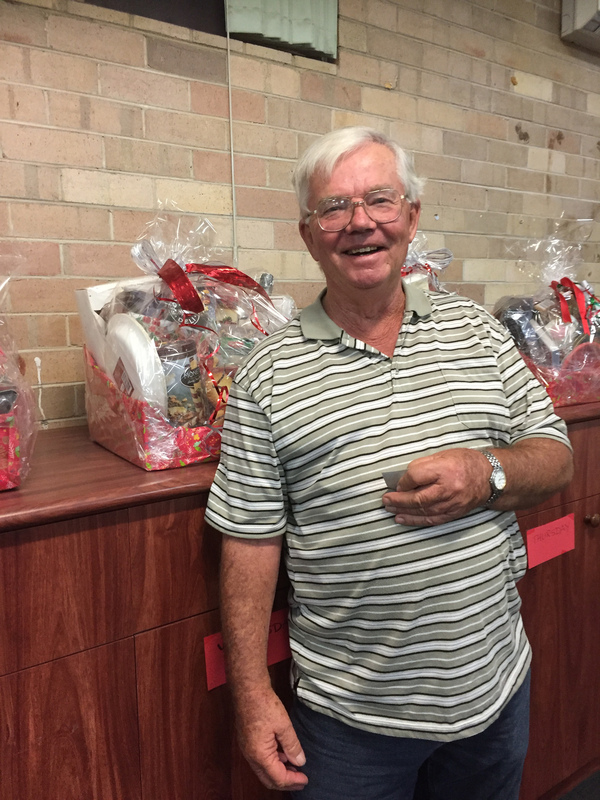 We will also have fun raffles, Devonshire teas and sausage sizzle. Live Folk Music with the magic voices of Jane Kira between 1pm and 3pm. Also a sheet in the shed for you to put your names down. We need volunteers to help on market day with the Devonshire teas, sausage sizzle, raffles, and any other fund raising activities. Dot will be making her usual Devonshire scones. These events will be promoted in the Spring into Armadale Festival guide and local papers. What’s on my Easel? Well, an octopus for one. And a rock wall with a vine and a wheat field. For as long as I can remember I liked to draw. I also had a love of horses. So that was what I would usually draw. Now, when I look over the paintings and drawings that I have completed over the last couple of years it is obvious that I haven’t settled on any particular subject matter or style. Ducklings and ants, spiders and horses, dandelions and kingfisher, telegraph poles, The Hulk and oh yes, an octopus. Over the last couple of years, I have picked up my pencils and started drawing again. Same story I hear from others; things like work, children and generally being busy tends to put things on hold. My son gave me an easel so I figured that I might try my hand at painting! I went out and bought some acrylic paints and some canvasses then trolled the internet for instructions on painting with acrylics. I was amazed at how many interesting and helpful tutorials are out there. I have experimented with different brush styles and using a palette knife. I really do enjoy trying a variety of ways to put paint on canvas. When I am not sketching or painting, well actually even when I am sketching or painting, I am Nana to 5 wonderful grandchildren. My daughter has been encouraging me to “put my art out there”. This I something I have never done, I guess I am rather shy and not all that confident. So, I started looking around for a group to be involved with and to meet other like-minded people. 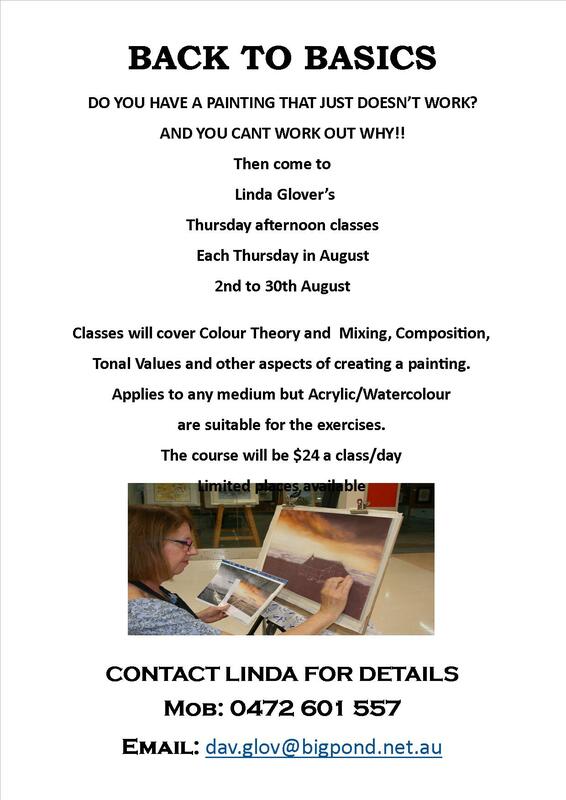 The Armadale Art Society sounded like the perfect fit and thanks guys, I have felt welcomed since I joined a month ago. Seeing all the wonderful talent at the Art House and the pop-up shop I am hoping to learn, be inspired and make friends. 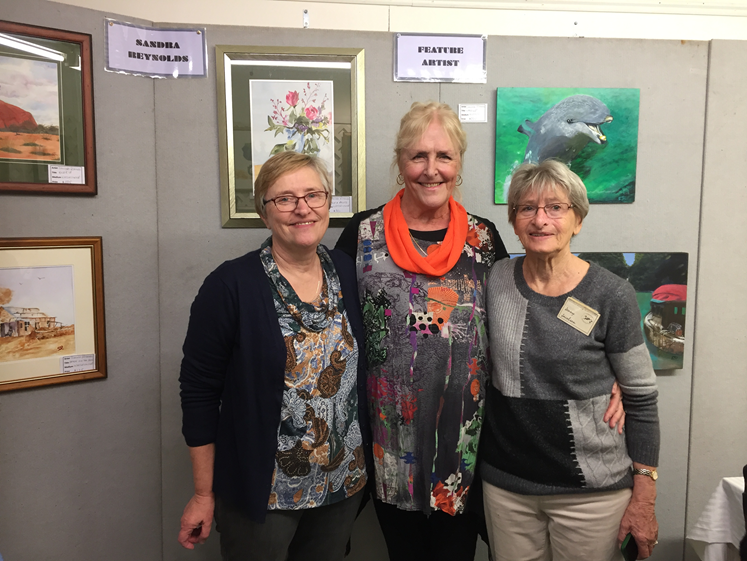 Annual Exhibition Update - Weekend of 26 to 28 October 2018. This years Exhibition is in the planning stages and we have a Sub Committee and Committee, working hard to make sure this is a successful event. To help us pay for our Event we have once again submitted for the 2018 City of Armadale Annual Contribution Grant, so keep your fingers crossed that we are successful, the decision is made in mid September. We will be officially Launching the Exhibition on Friday Evening 26 October and Henry Zelones OAM JP, Mayor City of Armadale will be officially opening our Exhibition. This years Guest Judges will be well known Perth Artists, Leon Holmes and Stephanie Boyle. By now you will have received your Entry Form and Roster sheet for this years Annual Exhibition. Our cut off date will be 4 October which is the Members Monthly Meeting. 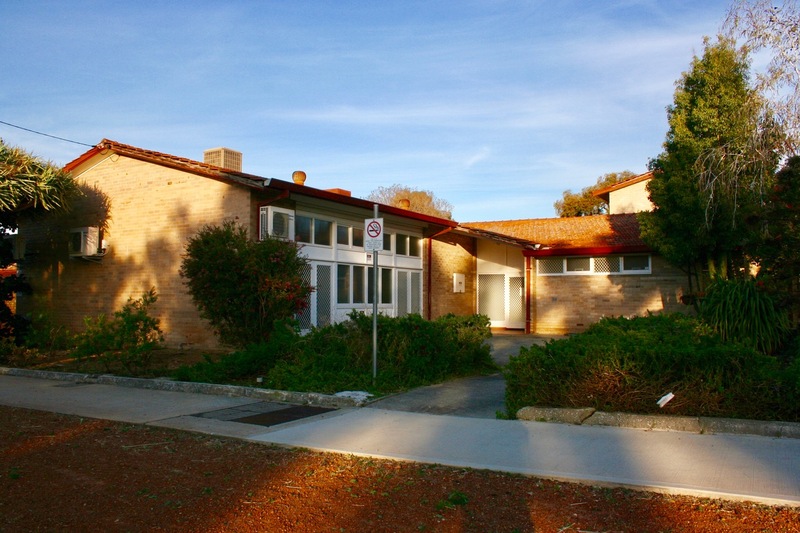 This year our exhibition will be held at the new Greendale Centre in Coombe Avenue, (off Hobbs Drive) Armadale. 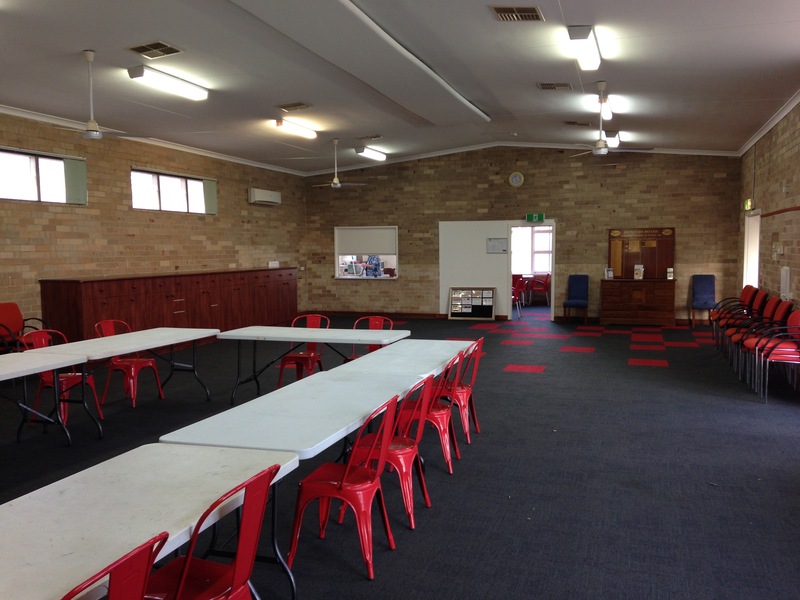 The floor space is smaller than the Armadale District Hall. So it has been necessary to reduce the limit to 3 paintings per member and the entry fee has had to increase to $15 per painting. This year ASA will be sponsoring our overall winner and runner up prizes to the value of $1000 plus other prizes provided by our generous Sponsors. How you can help! 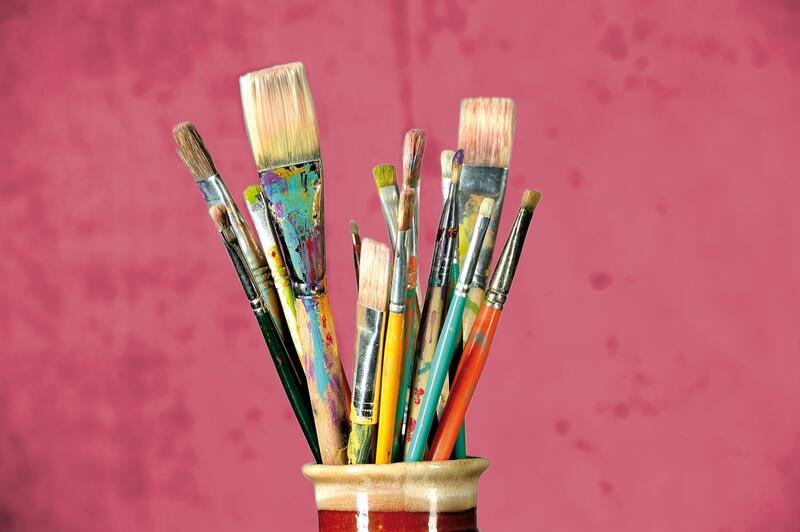 We are planning a special Sunday on 30 September from 10am at the Art House to paint Catalogue covers. The catalogue covers hold our programs for the Exhibition and is a great fund raiser for ASA. plus great value for our visitors who get to buy an original painting for $5.00. 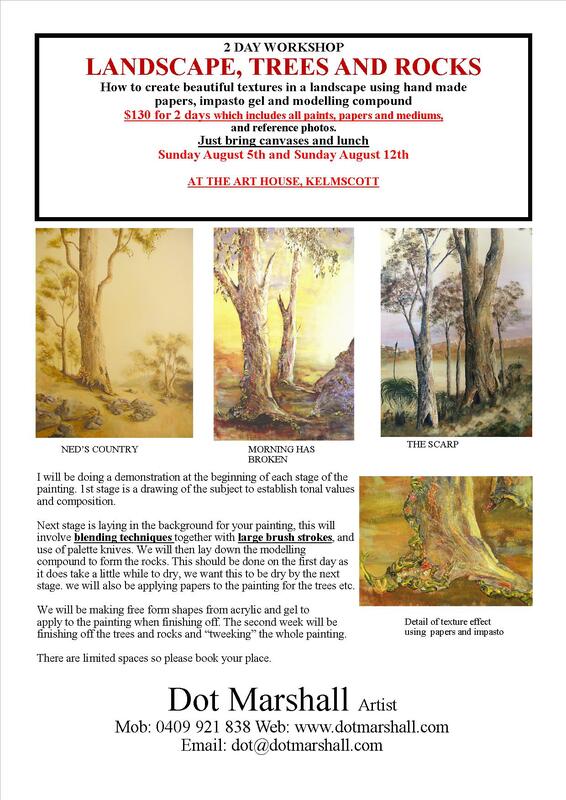 please rsvp to Maureen Smith on 0416 257 594. A little closer to the time we will have another day collating the Catalogue and the programs. Another way to help is distribution of our Exhibition flyers. 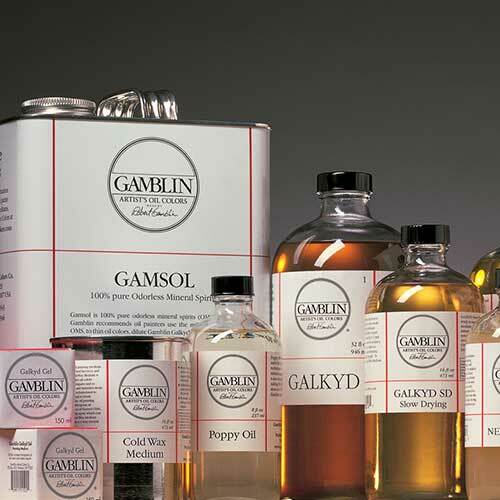 A supply should be available at the next Members Monthly Meeting. Please share with your Groups or Clubs, work, notice boards at local shopping centres, friends and family. 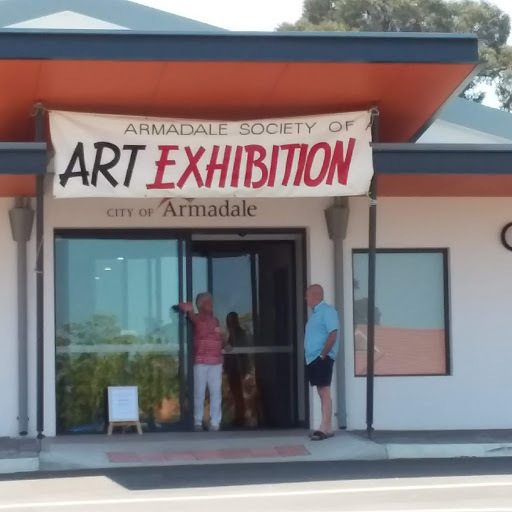 Our Exhibition is also listed in the Spring into Armadale Event Program or you can mention www.perthhillsarmadale.com.au and ASA website. Thank you to the City of Armadale Library, Claire Tomlin for their offer of art books that were donated to the library. Trish picked them up and they are now in our library at the Art House and Gallery for you to borrow. 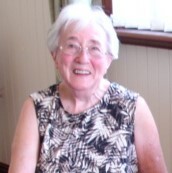 Catherine Kelley is a long time member of the society and a past president. She has been framing in the local area since 2010. 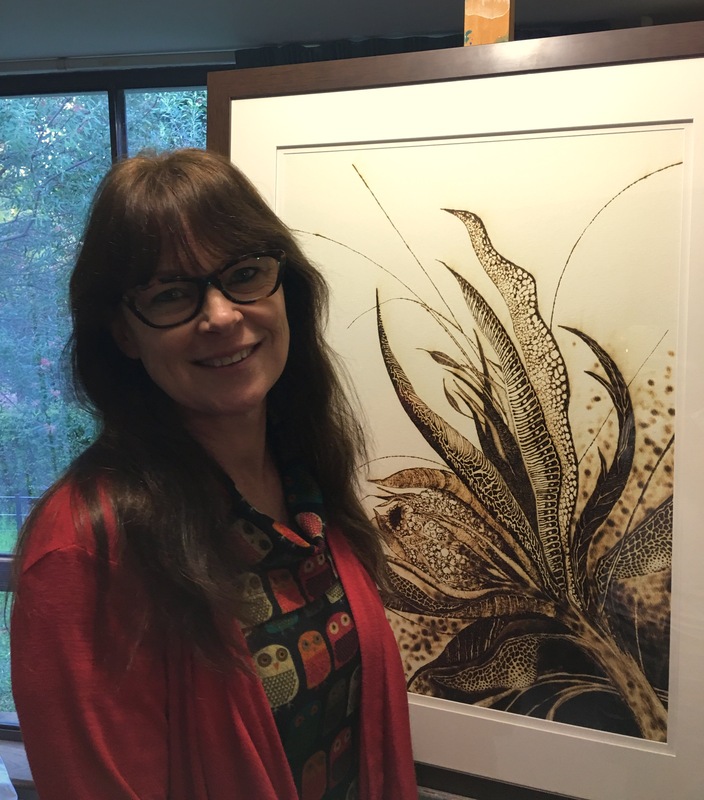 If you have any requirements for framing, Catherine has plenty of advice and creative ideas to help make your artwork look great. 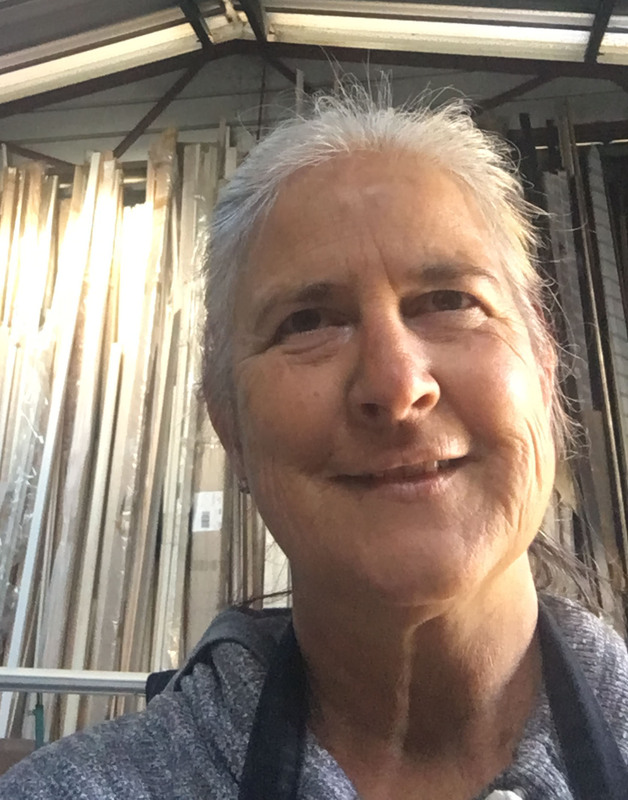 You are welcome to phone Catherine and make a time to visit her showroom and see a range of framing materials which includes mouldings, slips, Matt board, foam core, and even a few art supplies on hand. With the Annual Exhibition coming up soon it’s good to keep Catherine Kelley in mind.